Before starting a full-time course, applicants must complete a 2-week free intro course to learn the basics. After passing some test assignments, applicants are invited for an interview with a school representative. Lambda School is committed to helping students find employment by providing interview preparation, portfolio review, effective resume writing tips, and salary negotiation practice. Lambda School offers an Income Sharing Agreement where students start paying for the program after they find a job. We provide pre-course work lessons free of charge. A six-month full-time or one-year part-time online computer science course that’s free until you get a job making at least $50,000/year. During six months at the Lambda Academy of Computer Science, you will spend nearly as much time studying computing fundamentals and writing code as you would in most four-year programs. You'll not only be an excellent web development practitioner, but will have a deeper grounding in the fundamentals of computer science, including algorithms, data structures, operating systems, and more. In short, you'll learn the practical skills and modern languages required to become a software engineer, but also how to think abstractly and solve problems from first principles. We're so convinced you'll get a job after finishing our course that you can enroll and take the entire course for free. Once you get a job making at least $50,000/year, you’ll pay a percentage of your salary for two years. Check out our website for the details. A comprehensive, 30 week course that will teach you to be a UX developer. Lambda works, even for old farts like me. I am 45, 46. About a year ago, I lost my job. I had a mountain of debt, I hated my career track, I had no retirement savings, etc. And I wasn't sure where to turn. I knew I liked computers and believed that I could get a career going in computers if I could only get the right chance. I got on unemployment. They had a program to train for CompTIA A+ certification. My friends with previous work in the IT industry said I would get bored with that though. And I wouldn't make as much money as I would if I became a developer. I wouldn't be able to afford to go back to college for 4 years at my age. I needed a new career launch ... NOW. So I started looking at coding bootcamps. There was no way I could afford an upfront payment for a bootcamp that was $9,000.00 for 12 weeks. Besides, like I said, I was in debt to my eyeballs already, so I could not qualify for a loan anyway. Let's talk about the 12 weeks thing too. I was starting from scratch. I had a master's degree in the humanities and tons of life experience and I could find my way around an HTML doc. So then I found lambda school. Here it is almost a year later and I have launched my software engineering career. I'm making the kind of money I could never have made in my previous career. And I got here without paying a penny. I am paying them now, but I can afford it now, and there is no interest or debt. They invested in me and it turned out to be a worthwhile investment. Besides that, I have a new joy and passion for my career. I have learned so much at Lambda school. Sure I got the full MERN stack (Mongo, Express, React Node) training. But I also got a solid foundation in tons of computer science principles. I know operating systems, algorithms, data structures, computer architecture. I even have a decent intro to assembly language. I have learned so much more about what is going on under the hood. The most important thing I learned at lambda school was HOW to learn and confidence I CAN learn. Whatever hot frameworks and trending languages are today will not be the languages and frameworks they're going to want you to know in 5 years. I learned to program at a basic level in C, and also picked up Python in a matter of weeks. I am a full stack engineer now thanks to Lambda ready not just for a job, but a career. 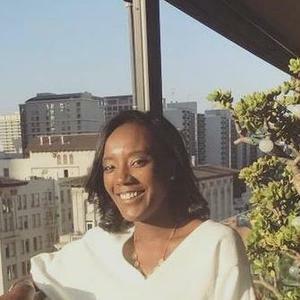 Within 6 months of graduating from college and moving to the San Fransisco Bay Area, the place I was born and raised, I came to the dreaded realization that I wouldn't be able to support myself financially. I was working 50+ hour weeks in a career path that I was quickly losing interest in. Coming into my career change I had barely any programming experience. The most I knew about computers was that there was a thing called the "command line" where you could execute commands to the Operating System. I began self-studying after work for 6 months before realizing I was ready to take the plunge... but I needed help. I had just started learning React and it was destroying my mind. I needed the accountability to push through the hard parts (I'm looking at you CS curriculum). I knew from college that I do well with remote/online classes. Plus the time saved from commuting to San Fransisco I got to spend working part-time. It was the instructors and administration staff that really sold me. They had excellent communication and answered all of my concerns right away. So I pulled the trigger on Lambda School, a new startup that had only 2 reviews here. I won't speak too much about the curriculum, structure, or job assistance because the thing about Lambda School is that they are always improving. Honestly, some of my experience was a little rough around the edges, but as I went through the program and became a Project Manager for later cohorts Lambda iterated on itself and improved. Everyone there is committed to your success (the beauty of an ISA). There are multiple disciplines to study now, insanely strong career support, and multiple opportunities to make real-world projects with a team (just as you do on the job). At the end of the day, Lambda School is not a miracle. It will be hard work, not only through the schooling itself, but in the many extra hours you will need to spend studying off of school time. Then there is the interview process, which is a whole beast in itself. And then a lifetime of learning to be had on the job. But if you are ready to dive in head first - to fast track yourself - Lambda School is the best and most painless way to do it. I decided that I wanted to pursue software engineering during my second semester of senior year in college (studying biomedical engineering), so I was learning web development during my free time while finishing up my degree. I was making good progress, but I wanted something more structured, as I found myself "getting lost in the rabbit hole" too many times. However, as a student with accumulated debt from the most expensive university in the nation and a family overseas, there weren't a lot of opportunities for me to consider. I had already turned down my return offer from the previous summer, as it just wasn't something that I wanted to do or saw myself happy with. That's when I coincidentally learned about Lambda School, while browsing /r/learnprogramming. Like a normal person, it sounded way too good to be true... What was an ISA? How could Lambda afford to teach people before taking money? I was too familiar with the current education system, where students are overwhelmed, but forced to take out loans, so obviously Lambda's system sounded too good to be true. However, I saw that there was a free intro course, so I decided to take it to see what Lambda was all about. Long story short, I was accepted to Lambda School and was convinced with the curriculum after taking the introductory "bootcamp." I told my parents that I was joining this program, and they were heavily against it, thinking along the same lines that I did (that it was too good to be true, that it had to be a scam). However, once they realized the amount of work that I was putting into Lambda and also outside of Lambda, they slowly began to realize that maybe Lambda's system could work. Lambda taught me to become a software engineer, not just someone who knows how to use a particular technology, but someone who can take those concepts and apply it to any other technologies. Lambda taught me a lot of various topics, but most importantly, Lambda taught me to be a lifetime learner. Lambda works, but to my own credit, I put in a lot of personal time outside of Lambda to be where I am today. I came to Lambda super hungry and I leave super hungry. I was fortunate enough to receive an offer before graduation, thanks to the help of my wonderful career coaches, so I'm not too familiar with how Lambda Next works, but I know that it's a great program with great instructors to help you on the interview journey. All in all, I wanted to conclude that I am very grateful for the opportunity be a student at Lambda School, and look forward to the growth of Lambda in the upcoming years! Lambda truly changed my life, as I went from a recent graduate from college to a software engineer in 6 months. Living in one of the world's most exspensive cities while making a minimum wage is not any easy thing to do, but that was the position I found myself in for the majority of my twenties. From fast food to grocery stores to Uber/Lyft, I found myself in a cycle of poverty that seemed impossible to break out of. After a series of unfortunate events towards the end of 2017, I found myself without a car, and out of a job. Fortunetly, this is when I started to notice ads for various coding bootcamps on my social media. Lambda School stood out to me because they said you didn't need a background in development or engineering, you just need a dedication to work hard. I believed them, and began to put in the work by Googling the basics of programming. A month later, I found myself accepted into the program, and two months after that I was starting my first day in class. Lambda's daily structure begins with a code challenge. These are designed to warm up your brain for the day and get you thinking the way a developer should. At the beginning of the course, these are relatively simple challenges, but the difficulty level is raised progressively as they course continues on. Next comes the lecture, two hours of highly interactive learning, with instructors having amazingly productive discussions with students. If something doesn't make sense, just ask. After an hour break for lunch(during which there are typically brownbag presentations), students begin work on a project related to the day's lecture. The instructors make themselves as available as possible during this time to lend a helping hand or answer any questions you may have. At the end of the day, you and a group of 6-8 other student have a standup meeting with a PM to talk about what went well, or any concepts you might be having trouble with. Lambda does not end when a student completes their course. A newer addition to the school is Next, a program designed to keep graduates engaged while searching for their new job. There is a Career Developement team that makes themselves readily available to any student who wishes to utilize the team's resources and help. The guidance provided during Next is just as important as learning the code. I am beyond grateful for everyone at Lambda who played a part in my success story. At the time of writing this, I have recently accepted a job offer, and will soon begin a trek across the country to start a new chapter in my life, all thanks to the opportunities Lambda School provided for me. I started out as a FT Full Stack Web student and picked up a side job as a teaching assistant for a PT cohort a few months into the course so I've seen Lambda from two sides and the view is refreshing. I recently picked up a FT development job and will be completing the course as a PT student. The first half of the curriculum is full stack web development split into front and backend. With only about 5 weeks for each, it's a firehose of information. In class and for projects, you work primarily with React / Redux / Node / Express + SQLITE3 for a database. You're also exposed to basic algorithmic challenges through code challenges and pair programming through peer reviews. By the end of the full stack curriculum, you should have built a full end-to-end complete application. They've recently changed the curriculum so that students will immediately go into Lambda Labs after the FSW portion of the curriculum. This is a 5 week group project with weekly deadlines, check-ins, and presentations. The projects are fully spec'd out by staff members and I believe will soon be fully integrated with at least one other type of student like iOS/Android or Data Science. My labs experience was a bit rocky due to group dynamics, but overall positive. Finally, the last part of the curriculum is computer science. I can't give much insight here as I have yet to take it, but you learn a bit of Python, a bit of C, and a smorgasbord of theoretical topics like data structures and algorithms, operating systems, computer architecture, etc. I'm really looking forward to getting into it. On a personal note, I went through some hard times during Lambda. 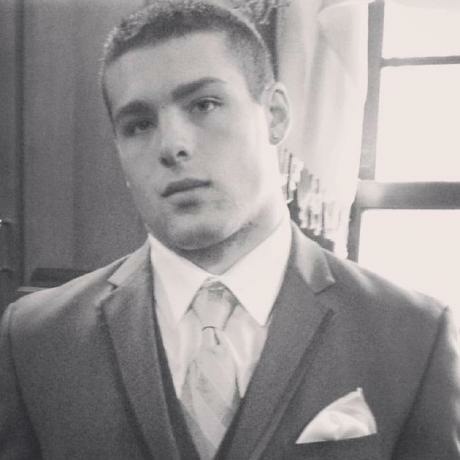 A few months in, I was in a serious car accident. With a concussion and several injuries to my spine, I was left in both a medical and financial bind and without a vehicle. I live in a very remote area, so I needed a car to get to a location with good enough internet to participate in Lambda each day, so I thought I would have to drop out. After a short discussion with one the staff members, the VP of Finance reached out to me to see what Lambda could do to help. I have never been driven to tears by someone's kindness before, but this was seriously so above and beyond anything that I would have imagined possible from just a school. Lambda is so much more than that and I will be forever grateful. Lambda has not only taught me how to be an engineer, but has also refreshed my faith in human decency. I fully recommend Lambda to anyone that wants to learn to code and needs that extra push of an incredible community surrounding you. I will be thrilled to pay back my Lambda Income Share Agreement and plan to donate further once I'm rid of my other financial obligations. Austen and the team are changing the world and I'd love to be a part of that in any way I can. Don't be deterred: it worth the effort and time! The best academic experience of my life. I dropped out two careers before Lambda School, an Engineering and an Economics degree. Those are beautiful studies, I learned a lot in all those years of study and I owe them a lot of what I am now. I treated programming and coding as a tool to perform better in my life and career, but then I realized that It wasn't a tool but my passion. Immediately I dropped out the current career, studies and job I had at that time, 2014, with the aim to be a software engineer in a mid-term. Whilst working full time, I started building and improving my Developer skills with self-passed courses, that really helped me. But then I realize that in order to accelerate my learning path It worth to attend a school, a proper and good school. A school whit a Computer Science curriculum was my objective. I'm not young and not old, I'm at the time I write this review 37 years old. I would love to attend a university and do Computer Science studies, but that was not an option, it required me to many years of studies, with my current age and family responsibilities that path was not realistic, the goal was to start working as a software engineer in a short-term. What to do? Look for a "boot camp"-like school with a strong focus on Computer Science wich teach modern market-technologies. In my research, Lambda was the sole school that meet my requirements: Computer Science curriculum, modern technologies and a modern school in contact and exposed to the top digital communities. It looked so great that I thought It was not real and unreachable. In order to be able to attend Lambda School, taking the best of the curriculum doing nothing but just studying, I had to take a big-huge loan to allow me to cover all my family and living expenses in all the 6-months of the curriculum and a couple of job-search-months. It was a scary and big life-bet I took. I had to be able to have a better job after Lambda or I would have serious problems paying the loan. IT WORTHED! I landed a new universe of job possibilities and career growth, much better than the one I imagined before Lambda. Here I'm graduated from Lambda, starting my new dreamed career working in what is my passion. Lambda is hard, is not easy, it requires a big dedication and a big effort --> don't be deterred: it worth the effort and time! I attended LambdaSchool Full Time online my I got my back locked up twice during the time here and the teachers were very helpful in getting me to get back on track and push through challenges. My laptop also died once and I had to miss class for about a week and again was motivated and pushed to get back in the program. At the time i was freaking out about missing those things but at the end of the program before labs I was put in a special class to go back over those things i missed or did not pass in the program. They really do make sure you know what your doing. It was easily the hardest thing i have ever done. My biggest issue is that I misunderstood what was the position of a program manager. Essentially I seen this as someone who should be better than me and push me to complete the course work and more. I was treating these individuals as Teachers and honestly they are just students that have passed the program and and have not gone to labs yet. That being said they can help you with the program but given how well lambda teaches you they don't know that much more than you do. If you accept this and take it just as a friend to bounce ideas off of it will be a much better experience 100% reccomend but only if your really interested in hard work. My time with Lambda was some of the best times that I have ever had. I was able to meet a lot of good friends and work with most of them by either pair programming, being a Teacher's Assistant or the final test of skills in Lambda Labs. Lambda Labs is a team based project that aims to simulate a real life project. You will meet your team. Colloaborate with them on the project such as what tech stack to use and also use Trello to set up tasks that you can then grab and work on and keep track of the progress on each task. Similar to the sticky note way that the guys on the HBO show Silicon Valley did with sticky notes and a whiteboard. you cannot afford to pay a bootcamp up front but.. If it weren’t for Lambda’s ISA, there’s no way I could have sold myself on this career change. I was already in debt from my bachelors and I couldn’t imagine taking out a private loan to pursue something that I may not have been able to do. That being said, 17-30k coming out of your salary over two years is a lot of money. Albeit this only occurs if you completely succeed and become employed in the field. It would have taken so much more time to teach myself this stuff. I knew absolutely nothing about coding, it would have taken me so much time to organize myself, to learn, to figure out what to learn. Easily twice as long as Lambda, more likely 3x. I simply don’t have the discipline to self teach. I need some organization, I need deadlines, I need to know someone will care/waggle their finger if I don’t get it done. I already went 30k into debt for a degree that I expected to start making me around 40-50k if I got a job in the field, so why would I shrink back from paying that for something that can make me double (and later more). Because it's only 6 months instead of 4 years? That's not a reason to pay less, really, but it is a reason to be excited. This is such a huge salary jump for me that missing some of my paycheck for two years is a small price to pay for a career I can stick with for the next few decades. And it’s not a loan that will climb in interest every minute you’re not employed. It starts and stops with your employment and it doesn’t change. Is this more than other bootcamps? For sure, but at least I only pay because it all worked out. That safety net is kind of priceless. This went by very quickly, it was very engaging, and surprisingly very social. I had only ever taken online courses in college and they were completely terrible. But lambda has really cracked the code on how to make remote learning engaging and social and fun. I have made closer friends in this program than I ever made in my four years of college. But of course this is a choice, you'll get out as much social engagement as you put in. But I think it's really worth it. Does Lambda teach enough to get you hired even if you know nothing beforehand? Yes. But you will absolutely have to put in your own time to make this happen. Hopefully you’ll want to because the puzzles of programming will entertain you. Lambda gave me an incredible base and with it I was able to determine what I needed to hone and work on in order to land a job. And they stay with you through that as well. When you finish the curriculum they'll keep helping you find areas to strengthen. I found nearly every project to be worth it and a huge source of learning. A few things here and there felt unnecessary to me, but that's going to be true of any program on earth. Can't perfectly please everyone. For the full stack web portion the first instructor I had (Josh) is an actual gem and I can only hope that Lambda keeps him for as long as possible. He made the introduction to this world so smooth for me, and exciting. I feel like he truly understands important, fundamental, pedagogical concepts and he carries everyone through with ease. My subsequent instructors were just okay. 4/5 kind of rating. Maybe 3/5 for 1 or 2 of them. Did I still learn from them? Absolutely. Will they only get better? Definitely. And while certain lectures may not have been ideal for me and my learning style, the projects were still great, the documentation on the topics was great, and I could of course do specific research and self teach in a highly organized way. This was totally acceptable to me and I don't feel like it's a weakness for the program. Bootcamp teachers are notoriously so/so, a great programmer does not always make a great instructor. BUT, I think Lambda is doing great despite that common issue. I got wildly lucky and secured a job before graduation. It was kind of a right time/right place sort of deal. I definitely put forth what the company wanted, but I also think I got very lucky. I don't think this is the usual outcome, and I was expecting a much longer application process. I can't speak to the career readiness/job assistance process at Lambda because of this, but from what I've heard they are willing to work really hard with you if you put in effort. They have a lot (everything really) riding on you finding employment, so you can bet they'll be helping you with it. Coding is not for everyone. I do think everyone can learn to do it, but I don't think everyone will enjoy it enough to make it through the learning curve. That requires a lot of effort and its easy to lose motivation if you aren't stimulated by this sort of thing. I think it's really important to keep that in mind and to be very honest with yourself about if it's at all enjoyable to you as you learn it. That's really more important than which bootcamp you choose. I tried college, all I have to show for it is debt. College does not prepare you for working in the real world to solve real problems. Lambda did prepare me for those problems. More than that, they've helped me every step of the way with searching for jobs. They provide interview training, resume building, they even go to speak on behalf of students to companies to champion for us. Lambda's model can be simplified to: If the student succeeds, then the school can succeed. Most importantly, I got hired as a developer. Don't make my same mistake if you want to get into the Web Dev field, skip the student loans. I joined in January of 2018 with some light experience with programming, very basic familiarity with a few concepts. The following months were a unique immersive experience that I found very rewarding. From the interesting projects to the incredible speed at which feedback was considered it always felt like the students were the top priority. Lambda seems to pride itself on having created a special culture and I would agree, they've succeeded. The Income Share Agreement system they employ is great for several reasons. It gives opportunities to people who don't (in my case didn't) have the money to pay for school upfront and aligns the interests of the school and students perfectly. The quality of their education directly affects the bottom line and it shows in everything they do. It's life-changing and empowering, truly a wonderful thing. The curriculum is quite varied and designed to provide you experience with a few technologies and the tools to learn others as needed. Everything is strategically designed to help you become a real software engineer, not just a "React Developer". Every topic they cover is done rather quickly, and it feels brutal at times. In the end, it's very worth it and works very well, and most of the things I would have listed as negatives have already been fixed in the most recent iteration. Job support is now fantastic as well, their Lambda Next program really provides a good balance between guidance, independence, and a solid support network. Everyone wants to help in any way they can and genuinely want to see you succeed. They move fast, there can be some hiccups but ultimately I think that's their biggest strength. If you thrive semi-independent in a fast-paced environment I would strongly suggest looking into Lambda. I started Lambda in January 2018. I would 100% recommend Lambda School. It’s very clear to me that they care about their students and they absolutely want you to succeed, hence the income share agreement: they only get paid when you’re successful. My last job was washing dogs at a corporate grooming salon for $10.50/hr. Yesterday I received an offer for a Web Developer position making six figures, with no qualifications other than Lambda School. I cannot stress this enough: I could not have done this without Lambda and the staff there. I learned so much in my time in the program, and not just programming, I learned how to solve problems, how to talk to people, how to work on a team and how to learn. It’s an intense program, but if you put in the work and actually ask for help when you’re struggling, it’s so worth it. The curriculum when I went through the program was great, despite being a little disjointed. However, I had the privilege of experiencing the web development curriculum again as a teaching assistant, and it has improved drastically since I went through it, especially the front-end portions. They are always accepting feedback and make improvements based on that feedback. My personal experience with Lambda staff has only been positive. There are so many people there who have personally contributed to my success and personal growth. They really do want you to get a job, and they will do everything they can to make it happen as long as you’re willing to put in some effort as well. If I would have stayed in school, I would still be multiple years away from getting a job, tens of thousands of dollars further in debt and I almost certainly wouldn’t have learned a lot of the practical skills I’ve learned through this program. In December of last year I applied to Lambda School, upon being accepted I began studies towards becoming a Software Engineer with no prior programming experience. This did not come easily for me, I put in overtime effort, and sometimes it was really difficult, but all of that hard work eventually paid off. The staff was incredibly helpful during the entire process and several of them will surely be lifelong friends now. I was able to gain valuable experience as a Teachers Assitant after I finished the program, but before I entered Lambda Labs (the in-house internship), which helped me to solidify my understanding on some things, and gain more in other areas. After completing the Labs portion, the staff was hard at work sourcing job opportunities and helping me to find a suitable position. This experience has changed my life. Prior to Lambda my income placed me well below the poverty line, and after Lambda, well, I can for the first time in my life say that finances aren't a problem. After 3 weeks on the job as a software engineer, I can say that my Lambda School experience has given me a rocket boost into a better life and career. My Lambda education prepared me to ship code my first week on the job with next to zero coding skills prior to my time in Lambda. 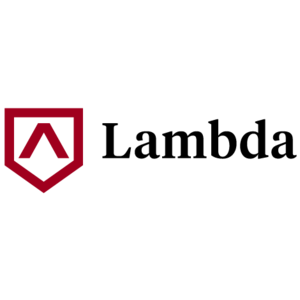 The Lambda Curriculum is an exhaustive, but carefully curated, list of languages, frameworks, and concepts that equips an aspiring developer with the skills necessary to be a competent full-stack engineer. When I was accepted and looked at the syllabus, I felt a bit overwhelmed by the number of topics the course would cover and I worried that we would only delve into each subject area on a very superficial level. Boy was I wrong!!! Each topic was covered thoroughly and I felt prepared for our weekly sprint challenges. The instructors and student success team were also incredibly receptive to student suggestions about ways to improve the curriculum. Lambda takes great care to keep the curriculum relevant to the skills its graduates will need to be successful in the job search and I can say that I was comfortable working with an unfamiliar codebase and shipping code on my current project thanks to the curriculum at Lambda. Everything Lambda does is focused on making sure that you get hired as a developer once you graduate. From ensuring have a substantive portfolio to show to potential employers, to having an assigned career coach who works tirelessly to help you land a job, Lambda is hellbent on making sure that their graduates land good jobs. If you are willing to trust the process and put in the work, Lambda will stop at nothing to make sure you are hired within six months of graduating from the program. On top of that, you don't pay anything back to the school until you land a job making at least $50k per year, so the school only succeeds if you do. There were times that I grew frustrated with the pace of the curriculum and felt like there is no way I could ever become a competent engineer. But the Lambda staff made sure I had all the help I needed to succeed and finish the program. This program is NOT for people who want to just coast by and think they'll land a high paying tech job. If you aren't willing to make learning your full-time job for the duration of the program, then you WILL NOT succeed in the program. Thankfully there is always someone available to help students who feel overwhelmed or fall behind in the curriculum. Everyone at Lambda School wants to see you win, I can personally attest to this because I would have never finished the program had it been for the support of my fellow students, the instructors, and the Lambda staff. Because of Lambda, I am a software engineer and I am so excited for what my future holds. I imagine right now that you're in a similar position that I was in about a year ago. You have a passion for programming and have heard about the industry breaking down walls of entry. So you gave it a honest shot, but quickly realized it's still pretty difficult to break in. They want you to know technologies you've never heard of, to have experience doing things (pair programming, agile, etc.) you couldn't possibly have without being on a team already, and even if you know these things, lots of times they'll tell you even though you know your stuff, you just don't have the experience. It's still tough and feels almost impossible without the right tools and knowledge on how to overcome these objections and prove your value. I tried the self taught route but struggled. Maybe instead you're confident with your programming abilities but want the opportunity to network and get some job assistance to boot. For me personally, I had zero experience and knowledge and went into the Lambda School program with a lot of fear and second guessing. The whole first month was me considering dropping out. There were times where I felt I would never get this stuff, more than I would like to admit truthfully. The project manager's, my classmates and the instructors helped me overcome those moments of self weakness though. That was part of the value of the program. I was forced to be accountable to other people who relied on me to do well. Over time, things that I struggled with became habitual and tedious. As the program extends into the final month before Labs, you start to wonder where the time went. For me, I saw the end and grew anxious. How was I going to find a job? Was I sure I had the skills and knowledge necessary? That struggle was almost negated by my career counselor, Courtney. She taught me how to look up companies, competing salaries in different geographies, how to fix my resume, how to talk to recruiters, interview tips, elevator pitches, briefcase pitch, and once I got my job offers, she taught me how to negotiate a better rate. There was not a single point where I felt like a nuisance or neglected. Everyone at the school is invested in you, and just the other day I was struggling with some new software I had to learn at my new job and I mentioned it to one of the instructors and we ended up going onto a Zoom (webcam) session and he shared his screen and showed me how to navigate the program and use it for what I need to at work. That's the real value of this program: it doesn't just end, you're always a Lambda School alumni and the staff are legitimately invested in your success. It's their whole business model! I now have a job making over the $50k minimum and have begun paying back Lambda School. The cost is well worth it, for the first time in my life I feel fulfilled and a lot less fearful about my future and my family. Lambda School didn't just change my life, they gave me the tools to change the lives of others too. Once I am rich I plan to pay it forward by donating to the Lambda Success Fund and giving other people like me the opportunity to do something that has the potential to change their life. The curriculum is excellent, you're learning cutting edge technologies from people who are well versed in how they align with enterprise application as well. However, due to this, the curriculum may pivot in the middle of it due to the way Lambda School works which can be frustrating, but it is for the best. Trust the system, they're doing this because they want to give you the best information possible. The instructors are for the most part excellent. They have Beej Jorgensen who is one of the smartest people I have ever met. Josh Knell, Sean Chen, Ryan Hamblin and Luis Hernandez are all excellent as well and each while being very intelligent are still approachable and have all spent time assisting me outside of lecture time and even outside of class time. It's just the kind of people they are. The job assistance is probably the best in the industry and is truly what makes Lambda shine. It has a dedicated team of career counselors and other business people related to getting Lambda hiring partners and exposing the program and its students to the professional world. They understand the importance of networking and encourage students, alumni and staff to engage with each other and keep each other apprised of their job progress. This adds another level of that accountability which makes the process even better. Lambda School, just like any other organization that has hundreds of students and staff all working together everyday for at least 8 hours a day, experiences periodic drama. It's unavoidable in my experience but the way it is always handled is impressive. The staff are very open minded and do their best not to punish people but to understand. This is a hard program and causes it to be a high stress environment at times, but thankfully the structure of the program allows students to capitalize on their teammate's, their project mangager's, instructors, and counselors to support themselves during those hard times. When it comes down to it, this is a professional environment and most of the drama occurs when people seem to forget that. Practice good communication, don't be afraid to speak up and voice your concerns, but do it professionally. Don't worry about how others are doing unless you're done and want to help. Your time in Lambda is rapid and you will want to utilize every minute of your day to dedicate to your project and growth as a developer. If you focus on yourself, your team, and then the rest of your cohort third, ask for help when you need it and participate in your class time, you will be successful. It's a good program, but you only get from life what you put into it. I believe in you! Lambda worked for me! I ended up with a really great job as a software engineer. Like most people that end up at Lambda I stumbled on to coding and found myself really liking it. So I learned as much as I could using free tools before I decided to find a structured program. I know for a lot of programs the financial requirements have changed since Lambda’s popularity but when I was looking Lambda was one of the few programs that didn’t ask for anything upfront. Nada. So I said what the heck, worst case scenario I drop out and waste a couple of months and best case scenario they live up to the hype and I end up a software engineer. The short version? Lambda worked for me! I ended up with a really great job as a software engineer. Now for the somewhat long version. To start Lambda is a startup that is constantly changing. That means if there is some part of the curriculum that isn’t working they’ll take the feedback and push an updated version pretty fast! And students and graduates will always have access to the new and older versions. The other side of that coin is that you’ll have to deal with the bumps along the way and if you want to see these changes made you’ll have to participate in the feedback loop, publically or anonymously. The instructors and project managers, in my opinion, make the Lambda learning experience special! Instead of someone just lecturing and giving you an assignment that’s due by a certain day, don’t get me wrong the course material and lectures are fantastic, you get a more personal education. You get split into smaller groups where your project manager knows who you are and will hold you accountable. You get to work with your cohort-mates, ask as many questions as you have, and get continuous feedback on how to improve. After the main course material, there is Lambda Labs an opportunity to work with a team to build applications for other. This portion of the program is grueling by design but its honestly led by some of the most passionate people at Lambda. They work really hard to get you over the finish line and prepared for interviews. And even after finishing, they keep working with you to find the right job. I started Lambda with very little development knowledge (some html and css) and got a job 2 weeks before even completing the program. The course was very challenging for me but an overall success because it got me to where I wanted to be.. hired! The remote setting can be difficult if you are easily distracted, but is great for those who feel most comfortable learning from their homes. The diverse coursework was a selling point for me as well as the option to do the ISA agreement. Lambda was first introduced to me via an add on Facebook. It was advertised as a Software Engineering program that requires no payment if you don't find a job in the field paying an annual salary of fifty thousand dollars or more. With a strong background in troubleshooting electronics and a deep desire to learn how to code, I couldn't pass up the opportunity. Being a skeptic, I dug up as much information about the program as I could to see if any scam reports were made or any concerns of legitimacy had arisen. To my surprise, I dug up blog after blog written by students participating or graduated from the program that expressed nothing but gratitude and gratefulness that they had the opportunity to attend. I thought, how could this be? Not a single negative review? It scratched the part of my brain that doesn't let good exist without condition, so I decided to apply so I could do my own reviewing. Living in a small, the only opportunities to establish a lifelong career are provided by factories and retail stores. I've worked in various retail and factory positions and let me tell you, I was miserable. With strong research and troubleshooting abilities, I was able to gain feelings of accomplishment and joy by volunteering to help an online gaming community in my spare time. I quickly became their "goto guy" when a new game server needed setup or if there was a serious problem with one of their existing servers. They quickly gave me a title as their "scripter". I really thought I had a solid grasp of coding concepts until I began attending Lambda School. I quickly learned that I had no clue! The more I learned at Lambda the more addicted I became to learning. Absorbing so much knowledge in such a short amount of time is the most invigorating thing I have experienced and I am not afraid to admit that I am addicted! Being a Software Engineer/Developer is just that, a career of learning. Of course, the salary is great but it's more than money for me. Lambda opened doors in my mind that I couldn't have opened myself. On graduation day I was winding down from the most intense learning experience I had ever endured when I began reflecting on the program. It came to me, the conditions required for something this great to exist. I had to be willing to put in the time and effort to persevere through an extremely steep and difficult learning curve. I had to stretch and bend my mind to reshape the way I learn and think. Those are the conditions required to be successful at Lambda and for me, they were worth every drop of blood, sweat, and tears! After over a decade in food service, I decided to pick my high school hobby of programming back up. I approached it the same way I had as a teenager - tinkering, breaking things, making toy programs that solved a tiny problem in a really inefficient way. Just a hobby really. The difference was that now I had a wife and a kid, and this kind of hobby, while intellectually fulfilling, wasn't going to magically pay the bills. Going back to college for years just to accrue massive debt wasn't really on the table for me. A friend of mine had graduated from a coding boot camp and got a high-paying job, and his testimony sparked my interest. After a lot of research, I found Lambda School. Lambda puts its students through a full stack education in three months. Instead of sending them off like a lot of schools, it holds on to them for two more months to teach those fundamental, transcendental CS concepts like runtime complexity, data structures, searching, and sorting. Then Lambda School puts the students into groups and gives them one last push to make an app using everything they've learned while in the program, teaching them how to apply their skills in a collaborative, professional development environment. For someone really wanting to break into this field and have staying power in the industry, it sounded like the perfect fit. Now here I am, six months later, and what has changed? Last Friday I finished my Labs assignment. Sunday I submitted my resume to a Front-End Dev position. Monday I connected with the recruiter. Tuesday I interviewed with the head of the development team. Wednesday I got an offer. Thanks to full stack curriculum at Lambda, I had the skills they were looking for. Thanks to Labs, Project Weeks, and Lambda Hackathon, I had the projects to prove it. Thanks to the CS curriculum and the whiteboarding practice, I aced the technical interview. Thanks to the career team, I had the negotiating skills to increase my starting salary by at about $25k from what it could have been. The level of support that I've received from this school cannot be overstated. I went from front-of-house to front-end developer in six months. That's real. I'm still in shock to be honest. Choosing Lambda School is choosing to bet on yourself. I can't recommend these people enough. Curriculum is top notch. I think it may be the best Web Development curriculum out there and why I was so willing to take that initial leap. They hire the best instructors in the industry. I don’t think I need to explain this more all you have to do is look at their credentials. Community. While being online can be a disadvantage it also allows more students to access the program. One of the things that many online schools lack is a sense of community. That’s not happening at Lambda School. There’s a sense of togetherness here. Feedback loop. This school is one that actually listens to it’s students and makes adjustments in realtime. You spend everyday working with people that are hungry. People that were never given a chance before ceasing on this opportunity. It’s truly inspiring and an environment that will bring the best out of you. To me this is the real magic of Lambda School. So, if you’re thinking about joining Lambda School it’s a no brainer. It’s what education should be. You have little to lose and everything to gain. I took a chance on a school that promised a lot and delivered more than I ever thought possible. I graduated in the first Lambda School Cohort back in January of 2018. I was quickly set up with a job at a startup company in SF. I was worried about what would be expect of me from a small company and most of my knowledge coming from a 6-month boot camp. What I didn't realize at the time was that not only was I taught the fundamentals of what a software developer needs to code but how to continue to learn and grow. I thought what they were promising was too good to be true but I ended up receiving more than I could have imagined. Best decision I've ever made. As a graduate of one of Lambda School's earlier cohorts, I still have access to the school's internal messaging platform with all the current students and teachers. Lambda School continues to get better, and for me, it was already the best. Today I am a Senior Software Engineer earning the highest salary I've ever earned in my life, and Lambda School is the only Computer Science education I've ever had. Before I applied to Lambda School, I looked into another program local to me. That program didn't do much to alleviate my initial hesitations, and when I was introduced to Lambda School I was still hesitant. But Lambda School made it easy to consider them because they provided the best answer to the one question at the center of my doubts, will this work? Before committing months of my life to a program, I wanted to know that it would be worth it. Lambda School's teachers are talented professionals from some of the best companies. Their curriculum was developed with input from the companies I wanted to work for. And the daily schedule is structured to keep students engaged and moving forward. They commit their full arsenal to every student free of charge until that student is able to secure a high paying job. What makes it even better, after graduation, they help the students to get that job. I had been a student many times before becoming one at Lambda School. Lambda has been my favorite learning experience by far. It is not self-paced, but you do feel some sense of independence. Only later did I realize how valuable that was. As a Software Engineer, you are expected to be able to find answers on your own. At its core, Lambda’s curriculum instills this in its students. Lambda School is worth it. I would definitely make the same decision again today. If you’re trying to decide whether you should apply or not, do it. Focus instead on getting admitted. I graduated from Lambda School’s first full-time computer science class back in January. I didn’t have much coding experience when I started and it was really hard but I enjoyed the program and feel that I learned a lot. There are were a few things that I did not like about it, though. I was in the first class, however, and I know that things have changed since I started in July 2017, but I can only speak to my experience. - Their free mini bootcamps are great (these are how I found out about Lambda School). - They have an income share model so I don’t have to pay for the education until I find a job in the field (and I feel like they’re invested in helping me find a job, otherwise, they won’t get paid). - They have great TAs who were really supportive and helped me understand the material whenever I would reach out to them. There were mostly 2 TAs when I was in the program, but they have many more now. - Their instructors are very enthusiastic about the subjects they were teaching. That kind of enthusiasm is pretty contagious (for me, anyway). They’re also willing to help me understand any concepts that I struggled with whenever I reached out to them. - The first half of their curriculum was great. It was pretty organized and well put-together. They knew what topics they wanted to cover and went over those topics. They changed the format of how they were teaching those lessons a few weeks into the program based on our suggestions/complaints, but they still went over the topics in the syllabus. - They were really responsive to feedback. I’m not sure if it was because we were the first class, but we saw a lot of changes. They really request a lot of feedback and are open to improving their teaching model as needed. I think that things have stabilized for the more recent cohorts, but I’m pretty sure they still request feedback every week and take that feedback into consideration. - They have career coaches who are supposedly very good, however, I’ve only had one session with my career coach due to personal circumstances that are delaying my job search. - The second half of their curriculum was a bit of a mess. They seemed to be flying by the seat of their pants and had some things on their syllabus that they didn’t seem to cover and other things that they covered that weren’t on the syllabus. I was in the first cohort, though, so I think they’ve fixed this portion of their curriculum. - They didn’t really have windows support. All the instructors I had were either using Mac or Linux and couldn’t help me troubleshoot my Windows problems (e.g. installing mongodb). It’s also little annoying when every lecturer is using the Terminal with Mac commands and I had to adjust some of the commands to work on a Windows Command Prompt, but I got used to it. I think they’ve since hired someone who knows Windows. - They were a little disorganized towards the end of the program. They had stopped updating our class calendar and had a hard time setting some important dates, but when we actually complained to them, they set up a meeting to answer all of our questions and updated our calendar. All in all, I had a great experience with Lambda School. I really feel like this school is invested in helping me learn the skills to become a programmer and get a job. Even now, I feel that I could go to anyone in the school for help and they would gladly help me. I would highly recommend Lambda School for anyone looking to learn to code. In my previous field, I was a top performer, but having bills and kids, my 18/hour job wasn't cutting it. I wasn't living very happilly when every paycheck was taken away for bills. I never quite had enough to do anything for myself. I had been programming since my teens as a hobby, and I decided it was time to persue my passion. After being accepted to 3 other coding bootcamps, but unable to afford the outrageous down payment of up to $15,000, I came across Lambda School. I was sceptical at first that Lambda was offering a complete 7 month CS course for 0 upfront, but after speaking directly to Austen Allred on the phone, I was reassured. I decided that since there was nothing to lose, to why not give it a shot! I just graduated with CS4 in April 2018, and I've gotta say that everything Lambda has promised has so far came true. What really amazed me is how I started getting offers and recruiters contacting me only based off of the Lambda School work. I am currently heavily focusing on landing that job, but with the skills and career development that Lambda provided, I don't think it will take very long at all! I took a gamble on Lambda. I was going to school for CS. Had 2 children and working for full time making $18 a hour wasn’t cutting it. I need to accelerate my track to becoming a Software Engineer. I went to Lambda learned skills the industry wanted and landed a job as a Software Engineer making a great salary. Thank you Lambda. In February we heard some interesting debates about the ethics of data science, how bootcamps are partnering with universities, and companies like Infosys and Google, and how the number of tech education options in Africa is growing! Plus, Thinkful attempted to predict the Oscars, the Ohio Lt. Governor stopped by Tech Elevator, and women in bootcamps were recognized. We also looked at various ways to pay for bootcamp, and tips for breaking into tech. Listen to the podcast or read the roundup below. Lambda School has taken its curriculum (and popular Income Sharing Agreement) abroad! 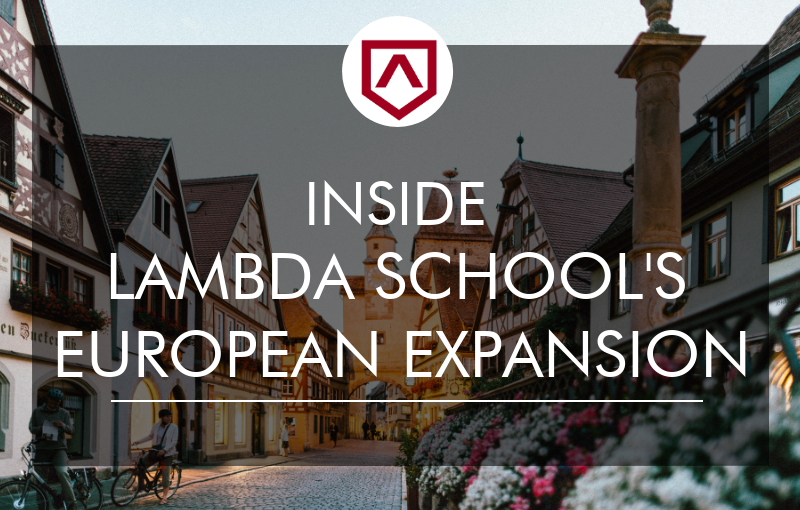 We sat down with Tommy Collison from Lambda to learn the motivations behind the school’s international expansion, how the ISA terms will shift for European students, and exactly what’s changing as Lambda School imports its curriculum to the EU and UK. Tommy, what is your role in Lambda School’s European expansion? I started off as a part-time student at Lambda School. I’m now the on the growth team, and my role is to help the school expand overseas as seamlessly as possible. I live in San Francisco, but I spent the first 19 years of my life in Ireland before attending college in the States. This gave me perspective on the differences between the American and European college experience. When I heard about Lambda School’s overseas expansion goals, I wanted to help, and I’ve been working on the school’s expansion ever since. What was Lambda School’s motivation for expanding to the EU and the UK? It really comes back to Lambda School’s central philosophy, that talent is equally distributed, but opportunity isn’t. Our goal is to reduce barriers to a great technical education. We believe that by bringing people of all different backgrounds together, we can take students from day one of class to Day One of a great new job. We’re committed not only to teaching our students the technical skills they require, but also to helping them find jobs that will change their lives. In expanding overseas, what will change about Lambda School? One big change is in the terms of our income sharing agreement, based on the way the European tax model works. Secondly, Lambda School lives or dies by the strength of our hiring network and hiring partners. We have amazing team members working on developing a strong hiring network, connecting our graduates with companies that want to hire developers. We'll continue to work on building this out in Europe, figuring out how best to connect the graduates from our European program with companies based here. Finally, the time difference was a challenge (in the US, Lambda School operates from 8am-5pm PST, which is 5pm-2am in Europe). Asking students to attend class at those hours was obviously not going to work. We’ve hired a new instructor who teaches on local time. We also had a lot of conversations about which language to teach the classes in, since so many different languages are spoken in Europe. Eventually, we decided to teach in English. Which countries/cities will Lambda School be expanding to? When Lambda School launched in the US, it was very important to us to be available all across the US. Two people can be equally talented and equally hard-working, but if one of them lives in a tech-friendly city like New York, Seattle, or San Francisco, they have a huge competitive advantage. So, when we launched in Europe, we similarly wanted to launch in as many places as possible. Our first European class started January 7, and included students from six or seven different countries. These students were from all over Europe, not necessarily just people concentrated in the big European tech hubs. Again, from the outset, our intention was to offer opportunities to as broad and as diverse a group as possible. Which companies are already in the Lambda School hiring network in Europe? Fundamentally, they’re the same kind of companies we’re talking to in America. There are so many American companies that need to hire a certain number of developers by 2020. These roles will also be in high demand in Europe. The skills that Lambda School students learn — from web development to front-end and back-end development — are skills that every company needs. In the London, Berlin, Stockholm, and Dublin startup communities, there’s going to be a huge demand for developers with the networking and computer architecture skills that Lambda School graduates come away with. Will you be tailoring the curriculum to cater to different market needs in Europe? At least initially, our students have been following the same curriculum we designed for the U.S. But we’ve also done our due diligence, working with European hiring partners and recruiters to learn more about what their specific needs are, and what it is they’re looking for. We’ve built the curriculum backwards from there. For example, Lambda School’s European cohort will learn web foundations, front-end, and back-end development. They’ll learn data structures and algorithms, and computer science side of things, such as networking and computer architecture. They'll also work on what we refer to as our “build weeks,” and lab projects – essentially building production-ready, stand-alone applications that they can later include in their portfolio to show future employers. It’s possible that in the future, there may be a specific skill or programming language which European companies are seeking. If that happens, we’ll rook at tailoring our curriculum to ensure that our students are learning the skills necessary to give them the best possible job prospects. How will the ISA (Income Sharing Agreement) be structured differently in the EU/UK? As in the US, Lambda School in the EU, will have no upfront tuition. Ultimately, we thought it made more sense to take a smaller percentage of a graduate’s salary for a slightly longer period. Instead of tuition payment, we charge our graduates 10% of their salary for four years, capped at 27,500 Euros or 25,000 English pounds. We do this because we want people of all backgrounds to find their way into the tech industry. We recently announced another change at Lambda School – we’re moving “graduation” from our lexicon. Graduating from Lambda School doesn’t mean anything until you get a job. We’ve now moved the job search portion of our school into the pre-graduation curriculum. We no longer consider a student “graduated” until they’ve gotten a job. What does that change mean in terms of a graduate’s timeline to start paying tuition back? The ISA is identical – students get more Lambda School for the same price. Our students don’t start making repayments until they get a job. It’s much more important for us to shift our focus towards graduates mastering their technical education, and finding jobs they love. The ISA seems extremely popular in the US right now (perhaps due to the cost of education and debt in the US). But is the demand there in Europe? I think so. Fundamentally, ISA’s represent an agreement between a student and the school. We want our students to do well; when they do well, Lambda School does well too. That’s why we invest so much in students and their education, in a way that most traditional European universities can’t or don’t. The student debt crisis in the US is on another level entirely – that kind of thing just doesn’t exist in Europe. But we think the ISA has a place in the European market. Salaries for developers, on average, are lower in the EU/U.K. than they are in the U.S. Do you think it’ll take longer for your European students to pay back tuition? I think our ISA repayment model, which involves having a smaller percentage of a European graduate’s salary taken out over a longer time period than our US students — over four years instead of two — will make a big difference. We’re confident that investing in talent is good for students, and good for the school. There’s skepticism around ISAs due to the fact that they’re largely unregulated. What measures do you have in place to stay transparent and accountable? There’s nothing I’d love to see more than high-level regulation of ISAs. It’s also important to understand how powerful ISAs can be in terms of opening up opportunities for people, and helping them get better jobs. We’re upfront about the terms of the ISA on our website. There are no asterisks. We’ve taken great lengths to ensure that our ISA’s are devoid of surprises or hidden terms. Every decision we’ve made regarding ISA’s has always been with the student’s best interest in mind. There are already a handful of coding bootcamps in the EU. What will set the Lambda School apart? For starters, Lambda School is a hybrid between a coding bootcamp and a traditional Computer Science (CS) degree. The length of the program is 30 weeks, full time, nine-to-five Monday through Friday, which is a lot longer than traditional coding bootcamps. That’s about 75% of the length of time it would take to attain a CS degree. That extra time allows students to dive deep, and for the material to become ingrained. Additionally, Lambda School is hyper-focused on mastery. Our courses are designed each week to be their own self-contained module. Students learn the material Monday through Thursday, and then on Friday they have a “sprint challenge assessment,” where they have to demonstrate their mastery of the material. Our students don’t continue until they’ve successfully demonstrated that mastery. Lambda School isn’t just making an investment in students during week one, week two or week 30. We’re ensuring that our students understand the material inside-and-out, up, down, backwards, and sideways. That’s the Lambda School commitment: it’s not about getting students through school, it’s about giving them the skills they need to succeed in the workplace. Can students start applying now? Yes. We launched January 7, and we've got full time classes starting in the next few months. 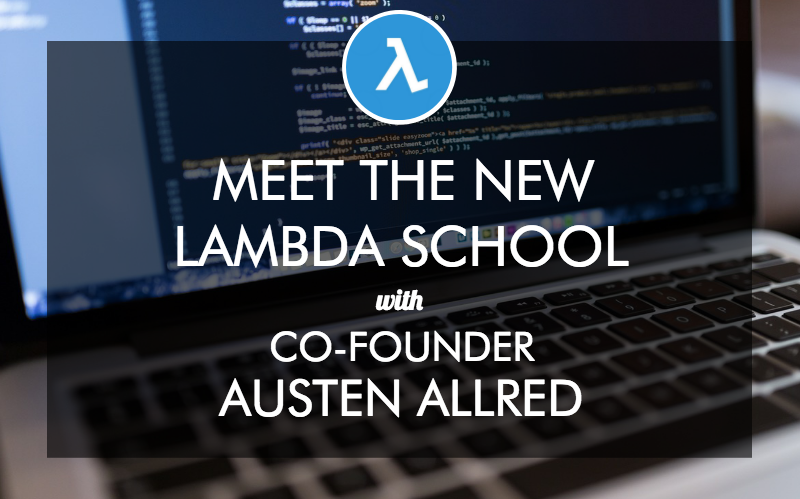 Find out more about Lambda School. You can also read more reviews here on Course Report. Burnt out from teaching high school math and science for four years, Joanne Jordan decided to search for a new career direction. After discovering the potential of Machine Learning at a startup, she enrolled in Lambda School’s online Data Science Track. 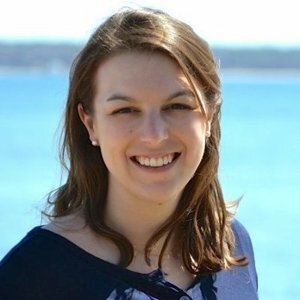 Joanne tells us how the vibrant online community kept her motivated to keep studying, how she built her capstone project analyzing health and environmental hazards in NYC, and how Lambda School invited her back to teach the next cohort of students while she figures out the next steps in her data science career! 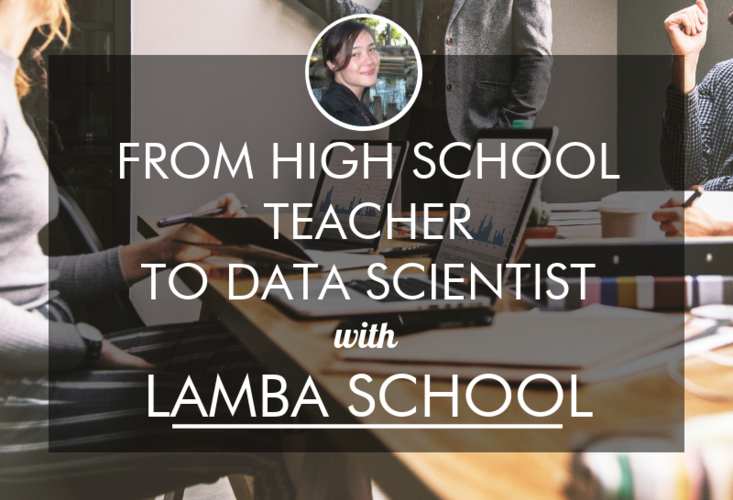 What is your background and experience before enrolling in Lambda School’s Data Science Track? Before taking the bootcamp, I had studied Applied Physics in undergrad and then got into teaching. I taught at a charter school in Brooklyn and over four years, I taught nine different courses in math and science ranging from algebra to calculus, as well as statistics, chemistry, physics, and computer science. I loved teaching, but it was a lot of work and I got burnt out, so I took a step back and did freelance tutoring while I figured out what I wanted to do next. I took a role as a temporary content writer for a startup SAT prep company called PrepScholar. They used Machine Learning to analyze the questions from different standardized tests and used those models to analyze student responses. They then create an individualized curriculum for each student to maximize their time and gain the most amount of points on their next SAT test. I was impressed with how powerful Machine Learning and data science can be, so I started looking into coding bootcamps as well as graduate school programs. What stood out to you about Lambda School’s online Data Science program? I kind of stumbled upon the program and I think I got really lucky in choosing it. Lambda School stood out to me because it was a remote bootcamp, but taught live. I need human interaction so the live classroom aspect was really appealing to me. Because it was online, I didn’t have to stay in one place – while I was studying I moved from New York, back home to Los Angeles. I also liked their income share agreement because the school is incentivized by my success – I didn’t have to pay until I found a job, so their fate was tied to my ability to get a job after I graduated. What were the Lambda School application and interview processes like? Before I was admitted, I had to do Lambda's free two-week data science precourse covering the basics on Python, statistics, and other concepts, then pass a couple of test assignments to be considered for the program. Then, there was a 30-minute interview with a school representative asking about my background and why I wanted to do the bootcamp. There was a question in the application about my background in math and coding, but it wasn’t a requirement for admission. What was your cohort like? There were around 25 of us in the cohort, which was a perfect size. We had a male majority (but not overwhelmingly), there was a good amount of racial and ethnic diversity, and huge diversity in background experience. Because of the intro course, there were people coming in with no programming experience. Some had studied math, some came from programming, and some didn’t have experience in either but because they passed the precourse, they were able to keep up throughout the program. It was a really big mix and Lambda did a great job of attending to the different needs of the students. In all of the assignments, there are basics and then more in-depth concepts, as well as stretch goals for those who had come in with more knowledge. What was the remote classroom experience like and how was the material taught? I was in the first data science cohort, covering topics in Artificial Intelligence, Machine Learning, and Data Science. Every morning we had a mini coding challenge to get us into the mindset and then there was a two-hour lecture on the topic of the day. The instructor shared their screen live through Zoom and the students simultaneously chatted together on Slack. The instructor could see our questions and we also were able to help each other. After a lunch break, we received an assignment and were encouraged to ask questions on Slack or make our own Zoom conference to pair program with another student. Each of us was also on a team of about 6 to 8 students and after everything was done, we’d connect to discuss how our days went, review anything we got stuck on, and help each other out to close the day. Our teams were really tight, so I never felt like it was remote – I have friends from the program! We’d fill out a form giving feedback about the lecture and the material, which the instructor would then use the next day to address any problem issues or clarify any questions. Did you have a favorite project that you worked on while you were studying with Lambda? We had two main projects: a two-week personal project and a four-week group project. The group project was a simulation of a Lambda client interaction, so they gave us an objective and we had to go find the supporting data. It was fun to work as a team and provide a completed deliverable. For the personal project, we could choose anything we wanted. We had to create a proposal and discuss the feasibility with the TAs. I’m a teacher, so naturally I’m interested in education and public health, and the related sociological elements. I decided to do my project through Small Area Analysis, where you analyze the data of small communities within a larger area. I looked at New York City’s neighborhoods and compared health and environmental hazard data alongside education attainment data. It was a lot of fun to combine my skills to do something that I was interested in and passionate about. How did your applied physics and education background help you during the data science bootcamp? Having a strong math foundation definitely helped me understand some of the concepts, and my experience working with people and knowing when to ask for help was one of the main factors of success in the bootcamp. It was really helpful to be part of a team where I could go and ask someone when I was stuck on something. Having a collaborative environment was similar to teaching since I was both a general education and special education teacher in an inclusive classroom environment. I would have to collaborate with the other teacher in the room and would ask senior teachers for help if I needed help figuring out something or solving a problem with a student. Those were skills I was able to bring into the data science bootcamp to help me succeed. How were you able to stay focused while studying remotely? Do you have any advice for others doing a remote program? I think that participating in the community was really important. It was really integral for me to learn with others because I had found I wasn’t able to teach myself the concepts alone. I took advantage of the live, interactive lectures, and knowing that at the end of the day I was going to be accountable to our instructors, the TA, and the team, kept me focused on completing the assignment. I think the community feel of Lambda School is fantastic – there are certain parts that you’re required to participate in, but the more you take advantage of it, the more you’ll succeed. Congrats on your role as a Teacher Assistant at Lambda School! How did you land the position? Lambda School is a really great environment and I’m really enjoying being back as a Teacher Assistant (TA). Initially, they asked me to be a TA for a part-time evening program while I was still a student in the bootcamp because I was performing well. After I graduated, I was working on some projects and trying to figure out what I wanted to do next when the head data science instructor asked me if I wanted to come back and be a TA for the second Data Science cohort. I was still connected to the community through career coaching, so returning to the learning side sounded fun! What does your role as a Lambda School Teacher Assistant involve? As a TA, I attend the lectures with the students and monitor Slack throughout the day to see if they have any questions. I also hold office hours in the afternoon through an open Zoom link and students can pop in any time and ask questions. I’m also assigned to a team, so I lead the meetings at the end of the day, and then grade and give feedback on their assignments. Having been a teacher at the high school level, I can see similarities in the way I work with and manage a group of students with different skill levels. Some students get frustrated with the material and some are very advanced and work through things quickly. I try to note the high performing students and give them challenges to raise their skill level. How does Lambda School prepare students for job hunting? Career coaching occurs once a week starting about a third of the way through the program. Career coaches give lectures on basics like writing resumes and cover letters, setting up LinkedIn, organizing portfolios, and networking. Students are assigned to a specific career coach who is connected to the business partnerships and they also are assigned to a team with an instructor whom they can ask for more technical questions and advice, or to read over a final submission for a job interview. Lambda School also has a program called Lambda Next, an opt-in, full-time program (and free if you’re a student) which has assignments geared towards helping you build your portfolio and network, to help you figure out your next steps. What are your next steps? Are you planning on staying on as a Lambda School TA or will you do something different? The TA position is intended to be temporary for Lambda grads so I’m looking at data science roles in fields related to education and public health or healthcare as my ideal next step. I’m also considering coming back to Lambda School as an instructor some day. They really value instructors who have industry experience, so I want to go out and get some real world experience and come back to Lambda better equipped to help the next group of Data Science bootcampers. Learn more and read Lambda School reviews on Course Report. Check out the Lambda School website. As we near the end of 2018, we're rewinding and reflecting on the most interesting and impactful coding bootcamp news of the year. Come with us as we look at trends, digest thought pieces, break down the ~$175 million in new funding, and more. We’ll also look at our predictions for 2019 and our hopes for the future of coding bootcamps! Lambda School offers an income share agreement where students pay nothing up front, and don’t pay until they land a job. It sounds almost too good to be true, so we sat down with Lambda School’s VP of Finance, Trevor McKendrick, to find out exactly how Lambda School’s ISA works, what the eligibility requirements are, and what the repayment process looks like. Trevor also tells us how ISAs compare with loans, how the Lambda School Careers Team works to help students find jobs, and what sort of salaries their graduates are earning. Anyone who is legally able to work in the US and have a US bank account can apply to use an ISA for Lambda School’s immersive courses. Grads start repaying once they are earning $50,000 per year. Grads pay back 17% of their salary for 2 years, with a $30,000 cap on repayments. If grads don’t find a job within 5 years, they don’t have to pay anything. Students can choose to pay $20,000 up front instead of using the ISA. Trevor, what’s your role at Lambda School and how are you involved with Lambda School’s income sharing agreement (ISA)? I work with students to make sure they understand their income share agreement. I’ve also helped create the FAQs for students on our website to make sure students understand what they are getting into when they sign an ISA. Finally, I work with our partners at Leif, who manage the signing, collection, and on-the-ground work for our ISAs with our students. Why does Lambda School offer an ISA? Has Lambda School always offered one? Lambda School has been around for just over 18 months and I believe we’ve offered an ISA for all of our immersive courses the entire time – the Fullstack Web Track, the iOS Development Track, the Android Development Track, the Data Science Track, and the UX Design Track. In most education today, you pay tuition upfront regardless of your outcome. College is a classic example: you pay all this money before you walk in the door, often taking out out large loans. It’s not that those schools don’t care about their students, but there is a lack of an incentive to get students a job when they graduate. We like committing to ISAs because if our students can’t get a higher paying job after we’ve taught them these new skills, then Lambda School ultimately fails. We are excited about that incentive, and students, employers, partners, and other people around the world, are also really excited about seeing an educational institute like Lambda School align incentives with the goals of its students. 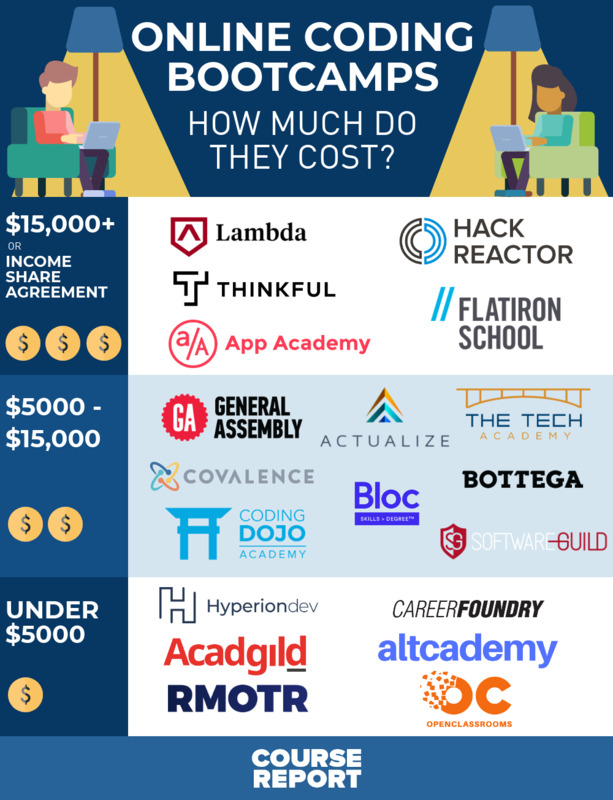 Can Lambda School students still pay upfront or are they required to use the ISA option? Yes, a small percent of our students choose to pay upfront. The majority of those are in the Data Science Track. The Data Science class tends to attract students who already have some sort of a development background, meaning they already had a job that pays reasonably well, so they feel a little more comfortable paying upfront. We’re happy to offer that to them. Can you explain why you chose to partner with Leif to power the ISA and how that partnership works? Leif and Lambda School were both some of the first organizations in the US to get into the ISA space – we’re one of the first schools to offer ISAs, and Leif is one of the first organizations to service ISAs. We both took a bet on each other, and it’s been working out really well. In our partnership, Leif services the ISA. They manage all of the contracts and signatures, then once a student has graduated and successfully increased their income, Leif also manages the collections on those ISAs. At Lambda School we have a really good relationship with our graduates, so we sometimes help with that and reach out to students too. 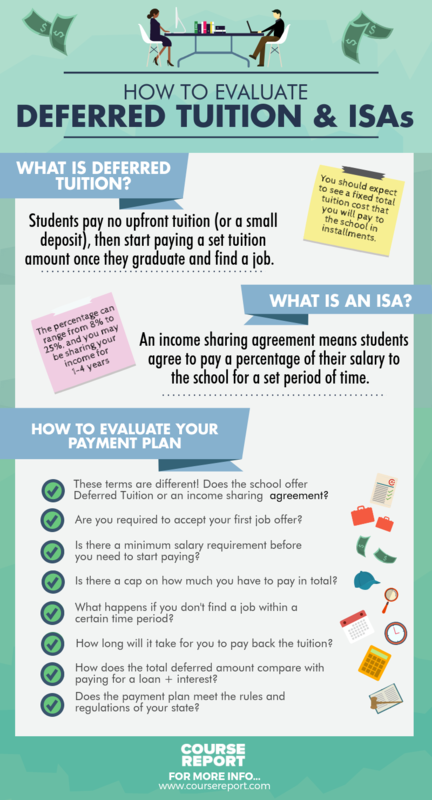 How do you make sure students pay back the ISA? When they sign their ISA, students agree to give Leif, our partner, access to their tax returns, so Leif does a reconciliation at the end of the year to make sure graduates have been reporting on their income accurately. There is an incentive for graduates to report accurately and pay on time because if they don’t, it could affect their credit score. In that way, the ISA is similar to a loan, in that there can be consequences if it’s not paid. During the application process are you assessing students based on whether they are a suitable candidate to pay back the ISA? Are you looking for someone with a certain background? No. We accept about 5% of applicants, but we don’t reject people because of ISA concerns. We accept students based on our judgment about their ability to succeed. We have various coding tests and an admission process where we do our best to determine an applicant’s potential. What are the eligibility requirements to get an ISA? Does a student have to be living in a particular city or hold a degree or have a certain credit score? The main criteria to qualify for an ISA is that you have to be legally able to work in the US, and you have to be able to have an American bank account. You can live and learn anywhere you want. If an American citizen with an American bank account is living abroad, that’s fine too. We just did a company retreat in Tampa Bay Florida last weekend, which wouldn’t be the first place you’d think of for developer jobs, but found we had 20 or more students who lived in the area, so they drove in to meet with us. What are the terms of the Lambda School ISA? There is no upfront deposit. Grads pay back 17% of their salary for 2 years, with the important caveat that there is a $30,000 cap. From the time the student graduates, we have 5 years to collect on the ISA. If those 5 years go by, and the student hasn’t increased their income to at least $50,000, then the ISA expires and we don’t collect on it. So if a student doesn’t find a job within the first two years of graduation, but finds a job within those 5 years, then they still have to pay back the ISA? Will you track students to make sure they are actively looking for work? We have an entire team of people working with employers across the country to help our students get jobs. It’s something we think about constantly and spend a ton of resources on. That said, at the end of the day the student has to want a job, and be willing to put the work into preparing, applying, and interviewing. Since it’s in Lambda School’s interest to get paid, how will Lambda School make sure grads find jobs earning over $50,000 (the threshold amount)? The vast majority of jobs students get after they graduate are above the $50,000 threshold. The median starting salary of Lambda School grads is around $70,000. One responsibility of our outcomes team is to identify employers who are looking to hire junior developers, and invite them to do a brown bag talk with our students once a week. They love doing that, and they do it with the stipulation that they will also interview some of our students. And again almost all of them are employers that will pay more than $50,000 a year. How many graduates have already paid back their ISAs? On average, how long does it take for graduates to pay back the ISA? Graduates are definitely already making payments on their ISAs. But the ISA payments are over a two-year period, and we haven’t yet been operating for two years so no one has paid back a full ISA. Barring some emergency, we don’t expect it to take much longer than two years to fully repay your ISA. Some of our best students do end up with six-figure jobs, and developers tend to get significant rises pretty quickly, so some will end up reaching that $30,000 cap in less than two years. For students trying to decide between another bootcamp where they can take out a loan, or going to Lambda School and using the ISA, what is your advice? What are the benefits of an ISA versus a loan? We have a repayment cap of $30,000, but when you take out a loan, there are fees and penalties for not repaying the loan. With an ISA with Lambda, you know that if we don’t do our job within five years, you don’t have to pay us anything. It was something you tried and didn’t work out, and you move on. If a student takes out a loan they are going to be on the hook for that loan plus interest, no matter what the quality of the school is. I would just recommend that you really look at how the school operates as a business, what are the school’s incentives, and can the school continue to operate if you don’t get a job? For most schools out there, they don’t need you to get a job in order to succeed. Find out more and read Lambda School reviews on Course Report. Check out the Lambda School website. What are hiring managers looking for in a new developer? A mix of practical engineering skills and foundational CS knowledge helped a Lambda School grad land a job at Utah fintech startup Divvy! We got to chat with Divvy’s VP of Engineering, Greg Larson, about why he chose to hire a coding bootcamp grad. 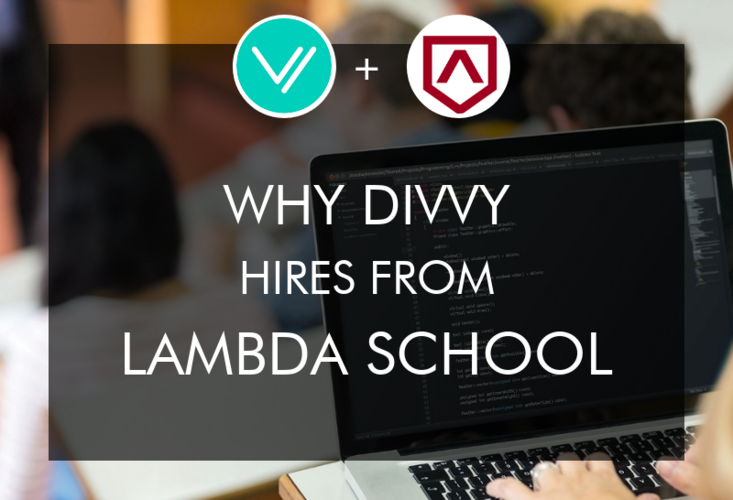 Learn what stands out to hiring managers during the job interview process and how Divvy is partnering with Lambda School to help their students get more real-world experience! Tell us about Divvy and your role there. Divvy provides a spend and expense management solution for small-to-medium size businesses. We essentially help companies get access to credit and each of their employees gets their own Divvy credit card where administrators can plan and track expenses in real-time. We work with clients across the board – companies with one or two people, companies with thousands of employees, and they span from construction, healthcare, nonprofits, education, and other tech companies. As VP of Engineering, everything technical reports up through me – software development, IT, DevOps, QA, and a few other functions. When I first started here, there were around 10 Software Engineers and since then, we've grown to over 30 full-time engineers across the board. One of my main functions is growth – sourcing, recruiting, and hiring our engineers. It’s up to me to strategize how we grow the team and what positions to fill. I used to lead interviewing and the tech assessment, but now that we're scaling, we've got more people to help with the process. I used to work a lot more in the code in our early days – we are a startup, so everyone wears multiple hats. I still oversee the higher level architectural decisions, so other daily activities include working with the other executives and teams here at Divvy to ensure that we're able to support the vision and the strategy set out. That often means considering a new partnership that requires some technical integration, seeing if there's an opportunity to capture more of a market with certain features or internal tools to enable customer success. I'm involved in a lot of those discussions to figure out how we're going to execute on the engineering side, and make it happen. How many Lambda School graduates have you hired? To this day, we've only interviewed and hired one Lambda School graduate – Antonio – as a Software Engineer. We do have one other Lambda graduate in our pipeline right now, and we're doing our final group interview with him later today – we'll see how that goes. How does Divvy usually source developers? How did you meet this Lambda School graduate? With our employees being so new at Divvy, we have a lot of fresh networks to tap into. We have a referral bonus program for employees that refer engineers. Also, because Divvy has been experiencing meteoric growth, there’s some buzz about us in the local industry and are attracting better talent than normal because of the good things we're doing and the media coverage. When I source candidates, I first try to search locally for people who have relevant experience and match a profile of the right kind of personality and culture fit. Our Lambda graduate came through a referral from a friend of one of our employees. We had heard about Lambda School, and how they take a different approach to the bootcamp paradigm. I had only heard good things about Lambda School, so I was excited to interview a graduate. Did you have to tailor the hiring process at all for a coding bootcamp grad? What does your hiring process look like? We kept the hiring process the same – we were pretty deliberate about that. We only judged him differently simply because he was a bit more junior, so our expectations were for a junior candidate. Typically, we have an initial one-on-one interview. Depending on the situation, it's either a phone or in-person interview. It's a basic screening, so we don't get too deep on any technical things – we explore the candidate's background and experience to see if their interests align, and we get an idea of how they work with others. Assuming all that looks good, we then send them the instructions for a technical assessment to do on their own time. They have to build an application which usually takes a few hours. We try to be sensitive to people's time, but it's not something you can just hurry and get done in one night. Once applicants return the tech assessment solution, we have a committee of engineers that reviews them. If everything looks good at that point, we have the candidate come in for a group interview or call in via video. We’ll ask about problem-solving, design and architecture, but there’s usually not a whiteboard test. Once the group interview is finished, if everyone gives the candidate a thumbs up, then we extend the offer. The way Antonio performed in his interview made us feel pretty confident that he's a good fit now, but we also saw a ton of potential because he demonstrated that he can pick up on things quickly. He had already shipped one or two real products, so that at all made us feel really excited about hiring him. He’s been with us since April 2018. What stood out about the Lambda School graduate you hired? What helped them get the job? We knew that we wanted to hire one or two junior engineers. Our Lambda grad, Antonio, immediately stood out because he seemed to have a great balance between being confident, but not being a know-it-all. In the past, it seemed like other bootcamps produced grads who felt they should be hired and get paid tons of money right away. On the other hand, recently, I’m seeing almost the opposite where I interview bootcamp grads who don't seem confident or sure of what they want to do. Candidates need to have a focus and understand the direction they’re going in. And Antonio had that. He had the confidence that he could do the job, but knew he would need to keep learning and progressing. He was really sharp in comparison to a lot of other candidates. He had applicable, practical experience, and knew the fundamentals of software engineering. That's something we like to see, especially because we're a fast-moving startup. People always need to be learning here – even our most experienced engineers are constantly learning new things. The ability to learn, demonstrate that you can learn, and use what you learned to be effective in your job, is really critical here. Did you have to convince your team to hire a non-traditional developer? Because I had heard good things about Lambda School, I was excited to see Antonio’s skills. I was curious to see if he would be more like a bootcamper or more like a computer science grad. Antonio seemed to be in the middle of the two, which was good. And because Lambda had a good reputation with me and a few other people whom I work with, I didn't have to really convince anyone. Bootcamps do a great job of teaching efficiently, but you can still only learn so much in a short time frame. Lambda School is a longer program at 6 months, which is good because students have more time to soak in information. Does Divvy have mentorship programs in place to ensure new hires are supported? Yes, we assign a mentor to every new hire, regardless of whether they’re junior or not. Even our new senior developers have a mentor for the first couple of months to help them get acclimated to their role. We also put together onboarding plans for every hire’s first few weeks. All of those things are more high touch with candidates who have less experience, so junior engineers get more attention. We work with them closely and make sure they have access to people to help them. However, since Divvy is still a startup and moving really quickly, we're not in a place right now where we can take on too many junior engineers. Antonio had some experience working as a professional Software Engineer, which is really helpful. No matter who you are, when you start at a new company there's a lot to learn; but if someone's already had a job in the tech industry as a Software Engineer, they've learned a lot already so we don't have to teach them the basics. Is there a feedback loop with Lambda School about their curriculum? What does that relationship look like? We're actually going to be trying something pretty exciting with Lambda soon. At the end of the Lambda curriculum, students do a capstone project and split into small teams. Divvy is going to be a partner company to give students more applicable experience with those projects. We're looking into sponsoring one of those capstone projects and be there to help, mentor, and judge projects. It’ll be a fun way to engage with the school and we’ll get some insight into how their students are doing. Also, because our back end is built in Elixir, a less common language, Lambda is even willing to invest some time into teaching a group of students Elixir. That's obviously a win for us because if we want to hire one or two of these graduates, they already have some experience with Elixir. Engaging with a school like Lambda is a lot of fun, and we’re building a good relationship. It helps the students because they get real influence from a real company, but then it also helps us because we get more insight into the curriculum and give input into how to shape some of the candidates that we might be interested in hiring. Does this mean you’ll be hiring from Lambda School in the future? That's the expectation. We're definitely growing, so as we have opportunities and the capacity to add more junior engineers to the team, Lambda School would certainly be one of the first, if not the first, bootcamp that we look at. What is your advice to other employers who are considering hiring from a coding bootcamp, or Lambda School in particular? Honestly, I think Lambda School is different enough that the same advice may not apply to other schools. Hire for potential and not immediate skill or experience; look for what the candidate could be capable of. Sometimes that's hard to assess, but look at how well they did after the bootcamp, even just in the first few months after. That tells me a lot about their passion, dedication, and ability to continue to learn. I would advise that anyone hiring from a bootcamp needs to be able to provide continuing education – more so than they would expect with other engineers. Expect that you're going to have to help them continue to learn because a bootcamp doesn't teach them everything. Bootcamps get them started on the path, but as an employer, you have to keep helping them along that path. Read more Lambda School reviews on Course Report. Check out the Lambda School website. How do you get started in Android mobile development? With cheaper (read: more accessible) devices and a large user base worldwide, Android jobs are abundant – but what makes a great Android developer? Chance Payne has a BA in computer science and is a self-taught mobile developer (and teaches the new Lambda School Android course) shares the ins and outs of Android. Learn about which devices use Android, get a better understanding of the Android job market, and see how you can be part of the next generation of Android developers. What happened in the world of coding bootcamps in July 2018? In our latest news roundup we look at the fascinating merger of two prominent bootcamps, an exciting fundraise for a bootcamp which focuses on apprenticeships, and a settlement worth $1 million. We also delve into the college versus coding bootcamp debate, celebrate lots of successful bootcamp graduates, and look at the proliferation of coding bootcamps in up-and-coming tech areas. Finally we look at new, innovative ways to finance bootcamp (and the potential for predatory behavior in them), and what the job market is looking like for grads right now. Read this blog post or listen to our podcast! The skills you learn in the classroom aren’t everything you need to work in a real tech job. Realizing this, Lambda School has launched Lambda Labs, a month-long final team project that gives students the opportunity to work in teams and build functioning products from start to finish. How do students in the online bootcamp collaborate remotely? And are these Lambda Labs projects helping students through the job interview process? We check in with Lambda School Instructor Ryan Holdaway and recent Lambda School graduate Cassidy Avery to find out! Ryan: Lambda Labs is the final experience for our students. Our goal at Lambda School is to train students to join dev teams and be able to contribute right away. We found that there was a gap between the kind of learning that takes place in a classroom and the kind of work that's done on the job. So we wanted to make that transition smoother and arm students with some of the practical skills they would need in their jobs. Before Lambda Labs, students were split into teams for their final projects and could brainstorm and pick their own project ideas. A lot of times, those projects ended up being loosely defined, too ambitious, incomplete, or not practical to show to a potential employer. We felt like that was a pretty weak final experience for Lambda School students before we sent them out into the job market. 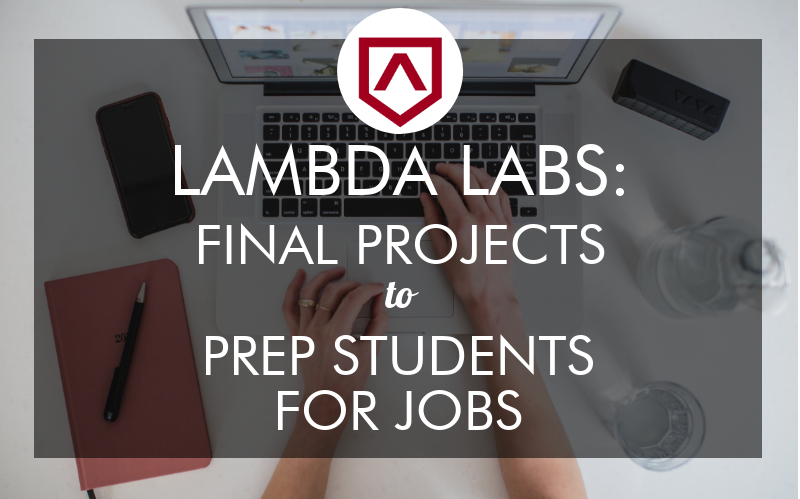 With Lambda Labs, we plan final projects in advance for students. We sometimes work with outside companies for that, or plan internal projects. The goal is for students to work on something that's useful from start to finish, professional and complete, and deployed to production on the internet. Our idea for Lambda Labs is to simulate a dev shop. Is Lambda Labs offered with all the Lambda School majors – Web Development, iOS, and Machine Learning? Ryan: Yes, it will be offered for all of the majors. We'll adapt it to each of the programs – web, iOS and machine learning. Students will work on practical, real-world projects that mimic a real job. Our long-term goal is to have students across different programs work together. For example, an iOS class and a web development class could work together where the web students write a back end system and the API, and the mobile students build a mobile client. How does Lambda Labs fit into the overall curriculum? Ryan: For the last month of Lambda School’s six-month program, students work on projects in teams of three or four, along with a project manager under the supervision of a professional developer. The project manager will lead students in daily stand up meetings where they'll discuss what each student was working on yesterday, what they accomplished, what they're going to be working on today, and any blockers that the team needs to resolve. Students pick their own tools as far as technology stack and toolchain, and what to use for the database, back end and front end system. Teams follow a Kanban style project management system with tickets on a ticketboard that they progress through, including things in progress, things in testing, and things that are done and shipped. They'll have a Trello board with tickets and wireframes in the design document for what the project should look like, and they build it to specification. We feel like that's really good practice for students going into their first jobs. When software developers start a new job, one of the first things they often do is build a project that somebody else dreamed up. We wanted to zero in on the skills needed for the job we were training students for. What sort of projects will students work on? You mentioned company projects and internal projects. Ryan: We have worked with a couple of organizations that gave out students projects. We have one month to work on a project, so if we find an outside project that fits within that scope, then we're happy to work with outside companies. For our most recent cohort, we partnered with an organization that plans concerts and music events in Austin, Texas. They needed a platform to connect performers, venue owners, sponsors, and other vendors. A couple of Lambda School students build that over the last month. If students don't have an external project to work on, they work on something planned by a member of the Lambda School team – a project that can be completed start to finish in one month. Ideas come from students, instructors, friends, and family. If students have ideas, we can work together to plan the project ahead of time so that preparation is done before the students start work. It's really important that they have work to do on the first day and are not wasting time planning a project and making product decisions. 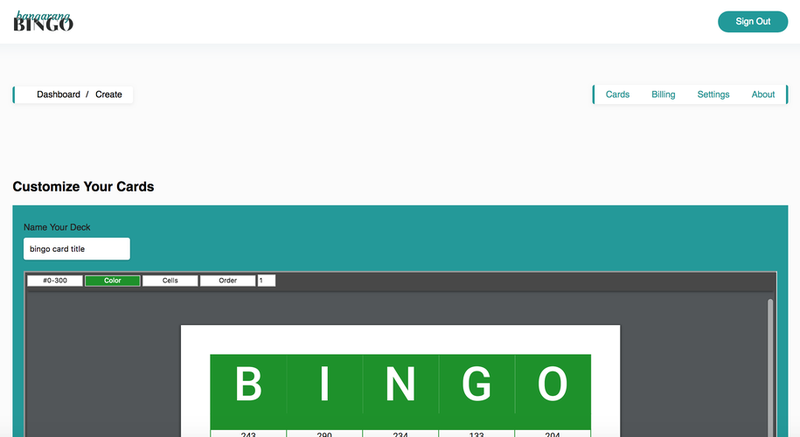 For example, Cassidy's team built a standalone SaaS product that's a bingo card generator where people can create custom bingo cards for a specific event. It's a party game. Users can input different choices for their event, shuffle all the squares, and print out a bunch of cards. It was a fun project that students worked on for about a month, and delivered a nice, functioning, SaaS project. Cassidy, can you tell us about your background and why you decided to enroll at Lambda School? Cassidy: I am a pure career changer. Previously, my career was a bit all over the place. I started out doing software integration for a hospital as part of the medical records team. That experience initially sparked my first thoughts that I should be doing something more technical, because solving problems and making things work is really satisfying. I also did a lot of customer service management. What made you choose Lambda School over another coding bootcamp? 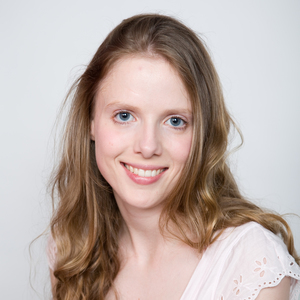 Cassidy: Finding a good fit in a coding bootcamp was a little difficult. A lot of bootcamps require a lot of money up front, or they need you to move to another city. For me and my family, that was not something that we could do. I heard about Lambda School in Spring of 2017. They were pretty new and small, but their goal was to align the school's needs to the students’ needs, and it was completely remote so you could do it from anywhere. They also don’t charge any tuition up front; instead you start paying once you get a job, which is really helpful to people that don't have the funding. Lambda School is also an excellent school. They've been trying really hard to bring in some of the best and brightest instructors from top companies like Google, Apple, and NASA, who have worked in the field and have really impressive resumes. In addition to teaching us, they can also mentor us and tell us what to expect when we’re looking for a job. I thought their team was really impressive, so I jumped in. What was the learning experience at Lambda School like? Can you tell me about a typical day before you started Lambda Labs? We spent about eight hours a day, hands-on coding. During our lectures, we were coding along while we listened, and we had sprints where we would also code along. Then we would have small projects to complete, either independently or paired. At the end of the week, we would have individual projects to reinforce what we had learned that week. It was a lot, but it was really good. We had many opportunities to reinforce what we were learning. Tell me about your experience working on your Lambda Labs project. What was your role and what sort of team were you working with? Cassidy: I worked on a three-person team with a project manager who was a Lambda School employee. Just like in a real dev team, we had someone who would check our project every day, we did stand ups every morning, and we would check in with each other. I did the full React + Redux build of the front end. I also started the database, got it to a bare-bones skeleton stage, then one of my teammates took it over and hooked it up to the other parts of the app. Our third teammate actually built the bingo card generator, and used a PDFMake at the end. We all had our own little parts, but regularly throughout the day, we were checking in with each other and saying, "Anyone need any help?" Even though we were working from all over the country, we could still communicate at any time via Slack, so all my team members were available at my fingertips. If one of us was stumped about something, or wanted feedback about an aspect of the project, it was so quick to hop on a Zoom call and have a quick chat. How much help did your team need from Lambda School staff? Cassidy: For the most part, we were using the knowledge we already had to build the project, or doing a lot of research, which is what you would do in the real world. For example, our third teammate was doing a lot of research, and trial and error learning, to use PDFMake, to make it work appropriately and correctly with our project. Just like in the real world, you don't know everything. It's impossible to know everything because the field is growing and changing all the time. We did what we knew, we learned what we had to learn on the fly, and if we got really stumped, we could always go to our project manager, and he might be able to guide us or point us in the right direction. Did you learn new technologies or skills during Lambda Labs, outside of the regular curriculum? Cassidy: The biggest skill we learned was how to work on a developer team. This was the first time we had worked on a project where we had different personalities coming together, making decisions together, and building things that would work together. We really learned to work with other developers in a different way. It was really helpful to have a project that was basically given to us by a “client” that had goals, a structure, and a clear idea of what we needed to work towards. We didn't have to hit our heads together about what we were going to build, but we still came together to make decisions on how to build it. Lambda Labs was definitely different than working on projects on our own and I'm absolutely glad that we had the experience. What was the outcome of your Lambda Labs project? Is it finished? Were you able to deploy it? Cassidy: Absolutely. It’s hosted on Heroku. It's a functioning product. It's bangarangbingo.com. That's awesome! And what are your plans now? How is your job search going so far? Cassidy: I'm based in Charlotte, North Carolina right now. I've applied to a few jobs here, and to a few remote jobs, and I'm starting to expand up the Eastern Seaboard a little bit. I've had some interviews and nothing's really panned out yet, but it's been a really good interviewing experience so far. I am actively looking, and hopefully, I'll land that first job soon. I’m looking for a role where I can use these new skills. I really like being able to do a little bit of everything on a project. So I am basically trying to find something that will give me more of that full stack experience and a chance to learn more on the job. How did the Lambda Labs project prepare you for interviewing? Cassidy: As Ryan mentioned, we used a Kanban board for planning our project. Now that I'm interviewing, I’m realizing that a lot of the companies are using the exact same sort of workflow that we used in our Lambda Labs project – Slack, Zoom, Kanban, and Trello or something similar. On top of those tools, it's great to show off a fully-realized, well-executed project that was built and deployed by our team in 22 days. Now we can all say, "We have these skills just like a normal engineer out in the field, we know how to work together, we know how to follow the lead of a project manager, we know how to use the same sorts of tools that are used in the field to manage projects, and we understand how to build these sorts of projects." I think it's really important to be able to show that we know what we're doing. As well as having that project to show employers, how else is Lambda school helping you with your job search? Cassidy: They have a dedicated Career Services team, who are awesome. During the last month and a half of the program, we had mini "brown bag sessions" every other week to discuss everything from how to structure your resume and how to use LinkedIn, to how to focus your job search. We also did mock interviews, and regular mock whiteboarding to prepare us for interviewing. Now that we're in the search process, we have regular follow-ups with the Career Services team to keep us on pace and make sure we're doing the right things. We check in with a career counselor at least once a week. And if they come across anything good for us in our areas that they know about, then they share that with us. So long as we're actually out there doing our due diligence and trying to find a job, Lambda Schools is also helping us find a job. 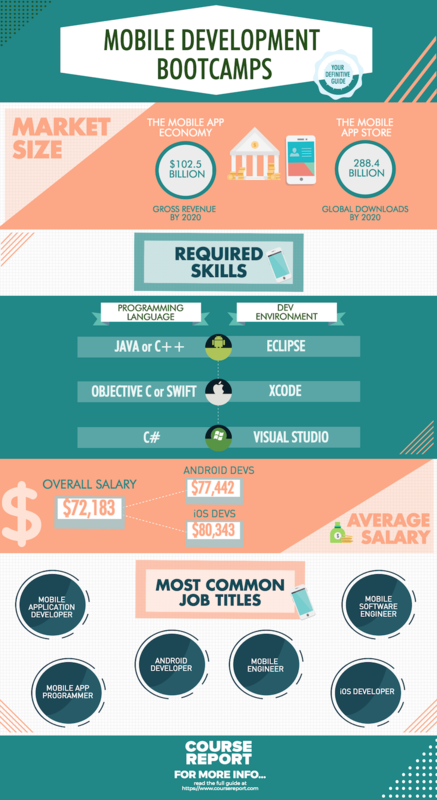 So you want to be an iOS developer! 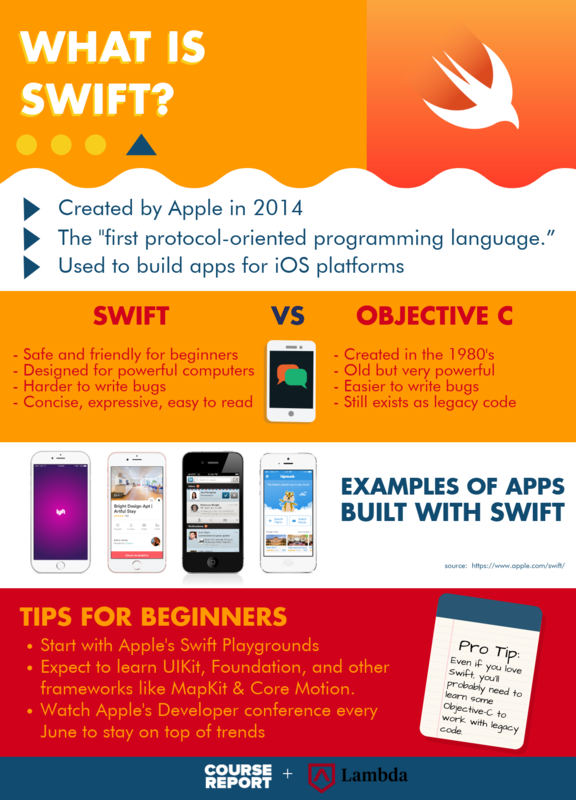 You’ve heard of Swift, but you’re not quite sure whether it’s the right programming language for you. In this guide to Swift we ask veteran iOS developer Andrew Madsen, who now leads Lambda School’s remote iOS Major, all about the iOS language Swift. We’ll cover the origins of Swift, the difference between Swift and Objective-C, and what the future looks like for the world of iOS programming. Plus Andrew gives some examples of apps built with Swift, and a few great suggestions to start learning. 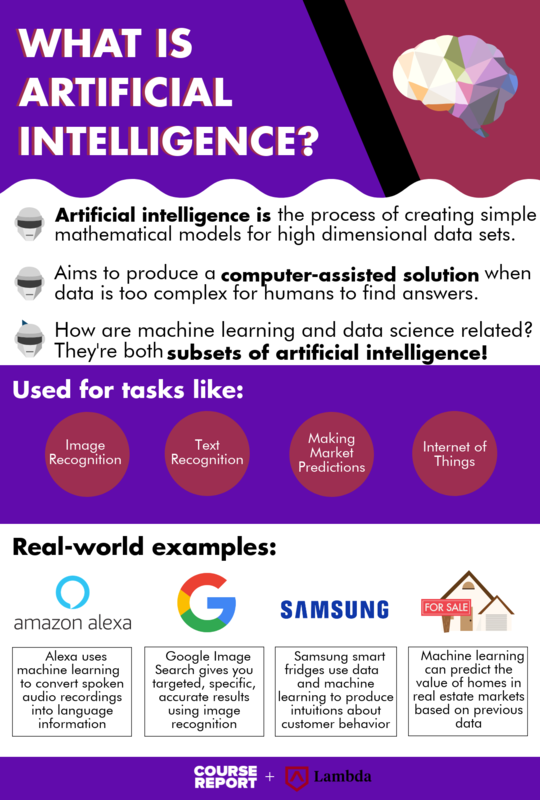 Artificial Intelligence encompasses computer science, machine learning, and data science, but what does it all really mean? We spoke with Lambda School’s Director of Machine Learning, Thomson Comer, to get the details. Learn about the history and growth of artificial intelligence, how AI is commonly used today, and see what it takes to succeed in a machine learning course like Lambda School’s Online Data Science Major: Machine Learning! Can you tell me about your background before Lambda School? I’m from Haiti and moved to Florida with my family when I was 10. Throughout elementary school, middle school and high school I was very involved in music, but also had a big interest in computers. I enjoyed taking them apart and teaching myself things. During high school and college, I did some web development and design projects for other students, but it was always just for fun; I never considered programming as a career. Not too long after, I came up with an idea for a startup. I created a business plan, submitted it to the Miami Dade Chamber of Commerce, and won a grant to pay for office space. So I quit my job to start working on it. I soon realized that I couldn’t build my idea without more skills. I started to teach myself software engineering concepts, then enrolled at Lambda School. Web design is very different from web development and software engineering. It’s like knowing how to make a house look nice, but not knowing how to build the house from scratch because you don’t know how to do electrical wiring, or plumbing, or construction. Once I decided that I needed to learn software engineering, I struggled with not knowing where to start. There are so many languages and frameworks. Do I learn Ruby? Do I learn C? Do I learn C++? Do I learn Swift? Do I learn Java? To tell you the truth – I’ve experienced what it's like to learn from Lambda School versus what it's like to teach myself, and I am so thankful that I went the Lambda route. There is no way I could have done it by myself. How did you choose Lambda School and did you consider other online bootcamps? I saw an online ad on Facebook or Twitter for Lambda School and they mentioned their deferred tuition – you didn't have to pay them back until you got a job. I had considered Wyncode and other bootcamps that were close to home in Miami. But I would have had to pay tuition upfront, so when I found out about Lambda School, I was really excited. When I attended a demo day at Wyncode, I found that a lot of students had graduated from college with computer science degrees and still needed to go to a coding bootcamp. If you get a computer science degree, you know a lot of the computer science theory and computer architecture, but not so much about frameworks and development languages. I wanted to know how to build software, rather than just the theory behind the tech, so that made me less interested in college. What was the application and interview process like for Lambda School? I signed up, sent in the application, and received an email saying they had received more applications than they expected, so I'd have to take an entrance exam. That freaked me out because I really wanted to get in. I did the exam, which was mostly logic and math, with no coding. Then a couple of days later I got the email saying that I made it. I was really happy! How did you stay engaged while learning online and balance Lambda School with your life? Lambda School gave me a full schedule on Google Calendar. From the minute I woke up, I had my whole day planned out for me. Class time was at least eight hours of the day, and I would spend extra time studying outside of class. I was actually interested in learning this stuff, so I spent my nights coding and my weekends working on projects. I started coding from the moment I woke up each day and I have a computer and desk at home, so I just studied from home. One of my hobbies is competitive bodybuilding, so I'm very active in the gym and work out a lot. That is a very important part of my day. After I finished studying and doing school work, I would go to the gym and work out, then come back home and continue studying. What was the time commitment for Lambda School? Could you learn on your own time (asynchronously) or did you learn with your classmates at the same time every day (synchronously)? The instructors taught us through live video lectures, so we could ask them questions, and they'd answer right away. The instructors paired us with other students for pair programming, and we worked on group projects. Every day I was interacting with other students and teachers. Lambda School taught the course from the West Coast, which was three hours behind me in Florida. It was actually good for me because I didn't have to wake up as early as everybody else. Most people’s schedules were 9am to 6pm, but I started at 12pm and finished at 9pm. Tell us about a typical day at Lambda School. One good thing Lambda School does is to make sure students don’t focus on one topic all day long. At the beginning of every day, the very first thing you do is a code challenge. They give you an hour to work on it, then you start the morning lecture and you start learning things that have nothing to do with that code challenge. After that, you move on to working on either a project that was assigned to you the day before, or a new project. The topics get harder as they progress because you start working on multiple concepts at once. Who were the other students in your class? Was your Lambda School class diverse? Yeah, it was very diverse. I studied with students from all over the country, many different races, women and men, and all age ranges. I liked that diversity a lot, because as a black man, especially in software engineering, I’m used to being the only other, the only person who is unique. Whereas at Lambda School, everybody has something unique about them, so that was really nice. Lambda School actually has a completely blind entrance program where they don't know the gender or the race of the applicant at all; instead, they just see their answers to the application questions. While you were at Lambda School, what was your favorite project that you worked on? It was a personal project which I really took to heart. It was a crowdsourced dictionary for Haitian Creole. I built it with React, and I was very proud of it. Before Lambda School, I thought I would need two or three years of React experience before I would be able to build something like that. How did Lambda School prepare you for job hunting? Lambda School staff reviewed our LinkedIn accounts and our resumes, and told us where to go to apply for jobs depending on what our interests were. Whiteboard practice was the most helpful. Part of web development job interviews is solving problems on a whiteboard, and people can get nervous being put on the spot and having to code in front of other people. Practicing whiteboarding at Lambda School in front of the rest of the class made the hardest part of the job interview much easier. Congratulations on your new job! Where are you working and what are you working on? 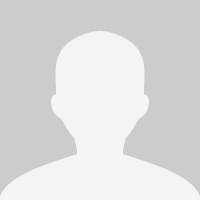 I'm a Senior Developer at Nexient LLC. It's in Ann Arbor, Michigan and I think the only completely US-based software services outsourcing company. It's a very big company, and we build software solutions for companies around the country. I've only been here for four weeks and love it. I moved to Michigan especially for the role. How did you find the job at Nexient? What was the application process like? I found it through a job listing website like Indeed or Dice. I sent Nexient my resume, then I got a callback. After that, I went through two interviews, then received my offer letter. During the interview, they tested I how much I knew and gave me a hard whiteboard question to test my knowledge. Because of that really hard interview process, I surprised myself by making it through. The position I applied for was a senior developer role. I just decided that I wasn't going to be afraid to go for it, because my entire life, I’ve always tried to go for hard things. How have your first couple of weeks on the job been? How did they onboard you and ramp you up? Nexient is also a very diverse company, just like Lambda School. There are a lot of women here, and I work with one woman on my team. I like everybody that I've met so far. Are you using the same programming languages that you learned at Lambda School or have you had to learn a new language on the job? How is your previous background in web design useful in your new role as a developer? It’s very useful. When I first started at Nexient, I asked my supervisor if I could restart one of my projects from scratch. I was able to come up with a whole new design for it, and it looks really nice. Now that you have a job, have you started paying back your Lambda School tuition? How does that work? Yeah. Once you start working and earning $50,000 or more, then you start paying 17% of your income. You pay that income-share for either two years or until you've paid $30,000. What advice do you have for other people who are thinking about making a career change through an online coding bootcamp? From my own personal experience, the coding bootcamp model does work, and it works well. As long as you dedicate the time and the energy towards it, you'll reap the benefits 10 fold. That being said, it was really hard. With my personality, I’ve found that whenever things are hard, I enjoy them more. I focused hard on Lambda School because it was really hard and I ended up doing really well. Just as they’ve developed disruptive education tools, technology bootcamps are also adopting payment plans which allow students to pay nothing or very little until they graduate and find a job. Deferred tuition and income sharing agreements (ISAs) are becoming more widely available, and give students who don’t have $20,000 in the bank, access to life-changing learning opportunities. This guide will help you sort through the details and differentiate between the terms; plus, we’ve even helped you start your research by compiling a list of coding and data science bootcamps that offer ISAs or Deferred Tuition. Why do journalists and industry leaders think that two coding bootcamps are closing? And despite these “shutdowns,” why do companies like IBM still want to hire coding bootcamp graduates? We’re covering all of the industry news from August. Plus, a $3 billion GI Bill that covers coding bootcamps for veterans, why Google and Amazon are partnering with bootcamps, and diversity initiatives. Listen to our podcast or read the full August 2017 News Roundup below. If you don’t get a job making over $50,000 a year, then Lambda School doesn’t collect tuition. Your commitment: learning online, full-time, for 6 months. Lambda School is “synchronous” education, which means you’ll need to be online at 9am Pacific and learn with the rest of your cohort. As the co-founder of Lambda School, what is your background and what inspired you to start an online coding bootcamp? I was going to college for advertising and found that college was not a very effective use of my time. In fact, my co-founder and I both stumbled upon this idea. I was not in the financial position to afford a bootcamp, so I actually never attended one. I figured out everything on my own by reading books and building projects. I wanted to create a more risk-free environment that was accessible to people that didn’t have $10,000 upfront. I had quite a few friends that did a coding bootcamp but didn’t have a good experience – $10,000 or more is a lot to spend at a bootcamp if you don’t get results. We created Lambda School because we wanted a bootcamp (plus a little more) that was free upfront and low risk for students. Tuition is an important part of choosing the right bootcamp – explain why Lambda School chose to offer a deferred tuition model. First, there are a lot of people who simply can’t afford to pay for a bootcamp upfront – that is obvious to anyone who has ever run a bootcamp. We’re so passionate about that idea that we don’t even require a deposit; it’s 100% free upfront. Even more than that, we wanted our incentives to be entirely aligned with those of the students. Part of our model is that if the student doesn’t get the job making over $50,000 a year, then we don’t make money. That’s very intentional. If we don’t do a good enough job, then we don’t get paid, and we think that’s fair. Bootcamps generally try really hard – but if a student pays $20,000 and can’t get a job, then that’s a really rough deal and we wanted to solve for that. We knew we wanted to create a longer course with a lower price-point than other bootcamps. Deferred tuition requires upfront investment by a bootcamp. We could almost fund the deferred tuition model ourselves but partnering with Y Combinator to fund the model certainly helped. Y combinator has done a lot for us – we have about 50 hiring partnerships through them and they understand tech really well. They were primarily excited about Lambda School having a deeper computer science curriculum than the average bootcamp. Y Combinator companies will hire thousands of engineers a year and they need a deeper level of understanding if they’re building world-changing technology. What should students expect with this new curriculum? We spent a lot of time talking to different employers – we wanted to figure out why some employers will not consider hiring bootcamp graduates. We learned that the best bootcamps will teach data structures and algorithms, but most don’t, and that there are a lot of subjects that bootcamps don’t have time to cover. Subjects like computer architecture, operating systems, scaling – that was the knowledge that employers really wanted their employees to have. And bootcamp grads, almost by definition, don’t understand that material. It’s not that bootcamps do a bad job, but they literally don’t have the time to teach that material. Lambda School is not just a coding bootcamp; we also include computer science as part of the curriculum. We’ll cover all the subjects that a bootcamp would, but we’ll also spend a few months giving a deeper understanding of computers and how they work, along with how to build apps to scale. Lambda School offers a more rigorous computer science lesson as opposed to just web development and web applications. Has the Lambda School admissions process changed? Tell me about the ideal students for the new deferred tuition model. When we were running a shorter bootcamp, we used the traditional interview and coding challenge. Now, one of the most important parts of the Lambda School admissions process is that we are entirely race and gender blind. We’ve built an applications process that won’t let us interject our own biases as to which students we accept. We developed a logic-based challenge with behavioral scientists to determine which applicants have the highest aptitude for a technical career. The two things we really look for is innate technical ability and dedication, not necessarily how much you’ve programmed in the past. Can you think analytically? Can you think at a technical level? If you give us someone who is really dedicated and sharp, we know that 6 months later we’ll have a really solid engineer. We also have pre-course work, and seeing a student complete that (especially quickly and thoroughly) also helps us know that they’re dedicated. Are there time-zone requirements? Do students learn synchronously and need to be online at a certain time each day? Yes. Students need to be available from 9 am to 6 pm Pacific. There is no way around this, because everything we do is interactive and live. Do you expect students in different cities to see different outcomes? In terms of students based in different locations, our main goal is to give as much access to as many people as we can. We originally wanted to host the bootcamp in San Francisco because that’s where the majority of our hiring partners are, but living costs here are expensive so it just didn’t make sense. We offer our bootcamp online so that people can attend from their own city without having to move and pay 6 months of SF rent. There are more jobs in bigger cities, but there’s also more competition from them, so we’ve had a lot of success in smaller markets as well. Is there required pre-work, or would you recommend taking a pre-course before Lambda School? We’ve designed our own pre-course curriculum in-house. We actually want you to apply first and then we send you the pre-course work after your application. Once you’ve completed that pre-course work, then you can begin the application. You don’t need any coding experience before Lambda School – the pre-course material will take you through the basics. It may take you a little bit longer to get through based on where you are in your knowledge but we wanted to create a course where you can just get started and we’ll get you through the rest. Do you have assessments or a way to track how students are progressing through the curriculum now that there is a new tuition model? We bake that into the curriculum. Everything is live and interactive. We know that there are self-paced, online programs that show you a bunch of videos- we’re not that. Everyone learns through pair programming and working together with other instructors and students. We have a pretty good pulse on our students’ progress- we have daily challenges, and we’re working in Git, so students submit assignments to instructors and we’ll get those pull requests. Each weekly challenge is designed to see how students are doing in the class so that we can dedicate resources where needed. Online education has a reputation for low completion rates. How do you keep students engaged while learning online? It’s hard to discipline yourself when learning online – if you get stuck there’s no one to turn to and it’s easy to schedule your way out of the course. 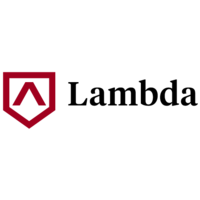 With Lambda School – we know when you’re online and we monitor when you’re working. There’s no difference between this and a formal classroom because we understand what people are doing throughout the course. What types of instructors are teaching at Lambda School? How do they ensure success for their online students? Our instructors have taught computer science at Stanford, come from the math program at Berkeley, and others have taught at coding bootcamps. We are matching Ivy league computer science knowledge with coding bootcamp expertise. We look for instructors who have experience teaching. There are a lot of people who are really good developers, but not as knowledgeable when it comes to teaching computer science. We do a good amount of training around ensuring our instructors know how to instruct. We usually give new instructors a trial run during our free mini-bootcamps that are open to the public. That gives us a good idea on whether we bring them on full-time. Your incentives are pretty aligned with students getting jobs – how will career services work for students? In the last few weeks of the course, we do resume preparation, update portfolios, practice for interviews, and code challenges. We have a career services team that’s there to help students find and land a new job. It all depends on geography. In the Bay Area we have a lot of connections and more partnerships. Outside of the Bay Area and New York, we do not yet have developed partnerships with every single geographic location, but we teach principles that help you find jobs. What’s the biggest lesson your team has learned at Lambda School as you’ve been developing this new course? First, don’t underestimate people. We’ve met some students who score well on the logic challenges, but for some reason when we talk with them we feel a little uncertain. Those are the people that always outperform. The people that you have to take a risk on and don’t have any other options – they prove that they’re really dedicated. One of the biggest misconceptions that we battle is that applicants believe that Lambda School is too good to be true. They even think we’re a scam because it’s different to see a bootcamp that only gets paid if people land a job. Our team would love for everybody to completely understand the bootcamp world, but not everyone has exposure to this learning model. We were surprised at how many people were concerned with degrees and certificates as opposed to skill. If you spend enough time in Silicon Valley, you forget that that’s the way most people think. They don’t understand that degrees are not what matters anymore. What is your advice for students embarking on a new online coding program? Any tips for getting the most out of it, especially if they are trying to change their careers? Be honest with yourself about what you need. We see a lot of people who say they can teach themselves and that they are dedicated and hardworking, yet two years later they are in the same spot. My biggest recommendation is to understand that it’s okay to have help. It’s okay to have someone else write the curriculum. It’s really hard to learn things when you don’t entirely understand what you need to learn. Have humility, work hard, and be honest with yourself if a self-paced program isn’t working for you. Don’t be afraid to make the changes you need to provide a structure that works for you. Lambda School starts new classes at the beginning of each month. Read Lambda School Reviews on Course Report. So you want to land a job after coding bootcamp? The statistics are on your side – 73% of bootcampers report being employed as developers after graduation. But did you know that many coding bootcamps go one step further and offer a job guarantee? We’ve put together a list of in-person and online coding bootcamps in the USA and around the world which offer guaranteed job placement. 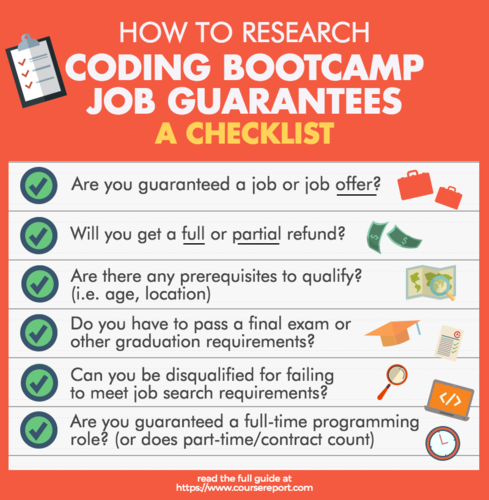 And don’t get caught off guard by the details – we’ve also included specifics about job guarantee tuition refunds, conditions, and tips to help you work out if a job guarantee coding bootcamp is right for you. Haven’t had time to keep up with all the coding bootcamp news this March? Not to worry– we’ve compiled it for you in a handy blog post and podcast. This month, we read a lot about CIRR and student outcomes reporting, we heard from reporters and coding bootcamp students about getting hired after coding bootcamp, a number of schools announced exciting diversity initiatives, and we added a handful of new schools to the Course Report school directory! Read below or listen to our latest Coding Bootcamp News Roundup Podcast. How do you get a job after coding bootcamp if you have no relevant, real-world work experience? Only 1.4% of bootcampers have worked as developers in the past, but most career-changers have little – if any– client experience when they start looking for a developer job. 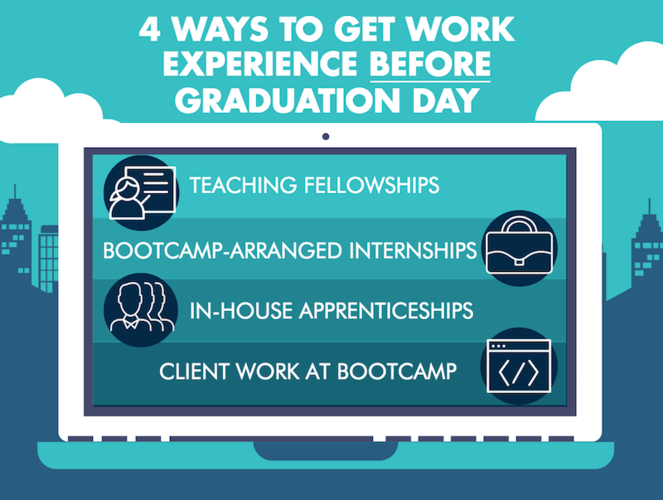 Some bootcamps help students overcome this hurdle by offering opportunities to work for the bootcamp itself, or with real clients through projects, internships, and apprenticeships. These opportunities can give students substantial experience to add to their portfolios and resumes, and kickstart the job hunt. There’s something about a good mobile app that just helps you throughout the day– be it your Linkedin, Google maps, CNN, Nike+ Training, or ESPN app– we depend on our smartphones for a lot. Due to the global rise of smartphones and tablets, mobile apps can be the go-to source for information, entertainment, productivity, e-commerce, and more. By 2020, global mobile app store downloads will reach 288.4 billion! With the rise of mobile applications on the market, the demand for mobile software developers continues to grow. 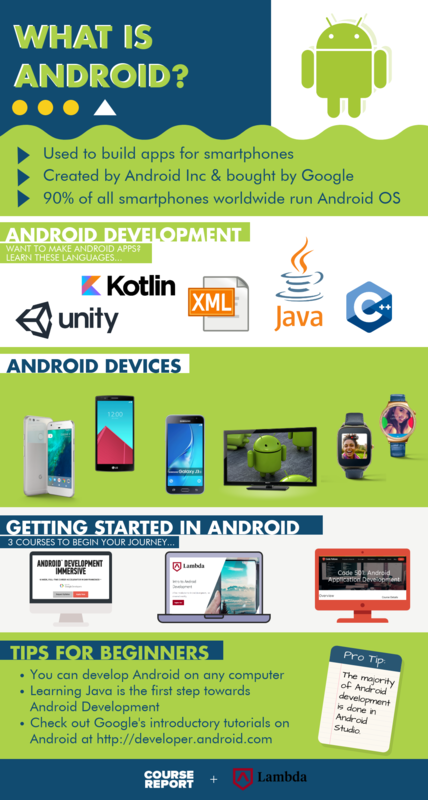 We thought it was only right to give you a breakdown of what it really takes to be a mobile applications developer. From educational requirements to general stats on the profession to the top mobile coding bootcamps around the world– read below for our Ultimate Guide to Mobile Development Bootcamps. Learn to Code (for Free) at these Coding Bootcamps! While programming bootcamps can offer a high return on investment, the average tuition at code school is ~$11,906, which is no small sacrifice. A number of not-for-profit and well-organized programs offer free coding bootcamps. Some of these bootcamps are funded by job placement and referral fees; others are fueled by community support and volunteers. Expect rigorous application processes and competitively low acceptance rates, but for the right applicants, there is so much to gain at these free coding bootcamps. Any other information you'd like to share with Karen Zachary from Lambda School? By submitting, I acknowledge that my information will be shared with Lambda School. An email with these details has been sent to Lambda School. You've already applied to this scholarship with Lambda School.